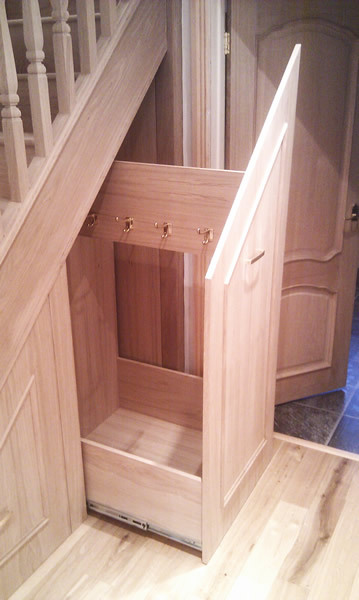 Leading Edge prides itself on its high level of craftsmanship and attention to detail. 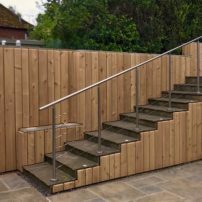 We work with the client from the conception of the idea, through the design stages to achieve their desired results at completion. 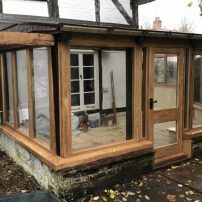 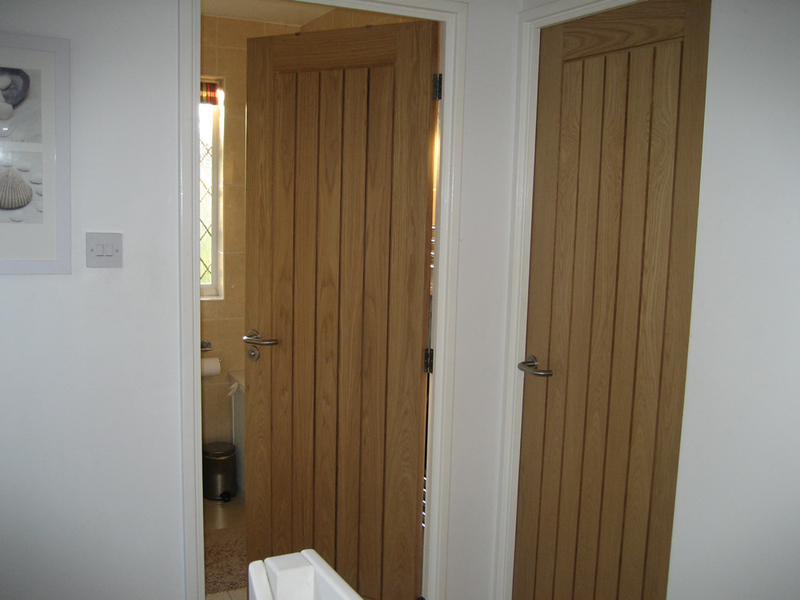 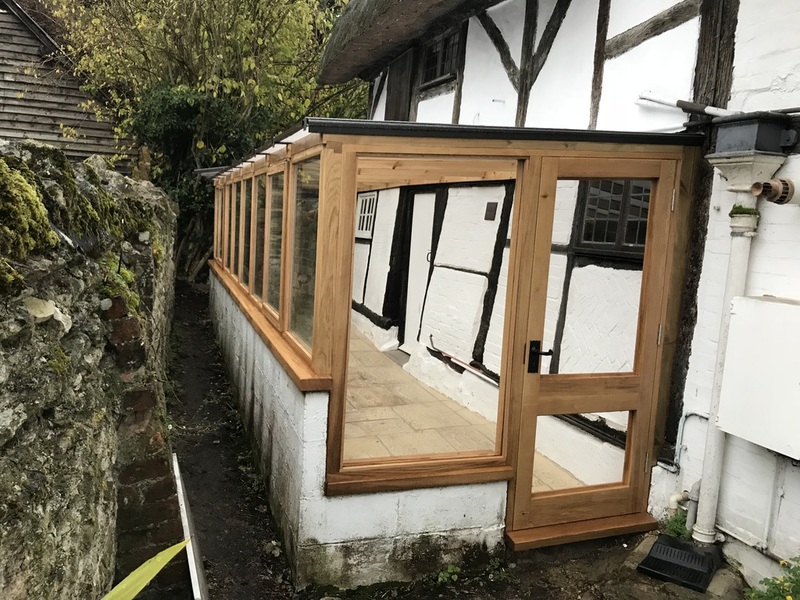 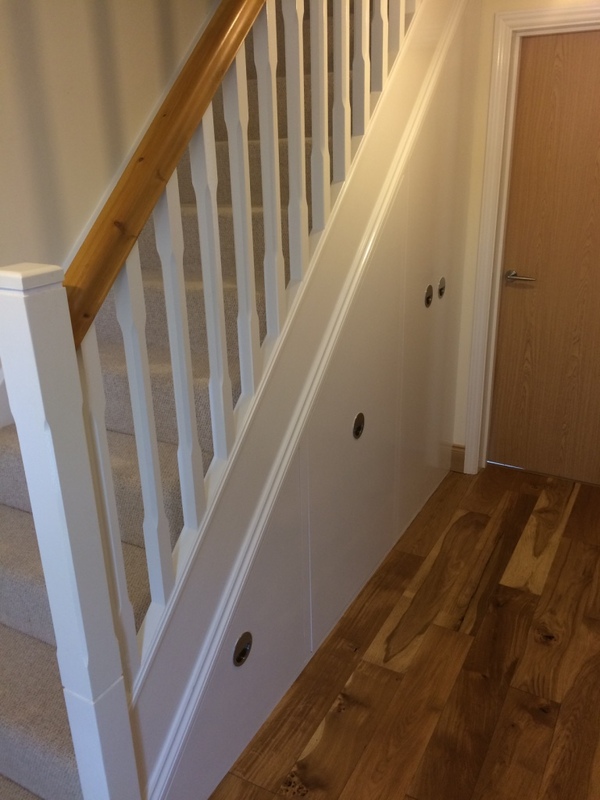 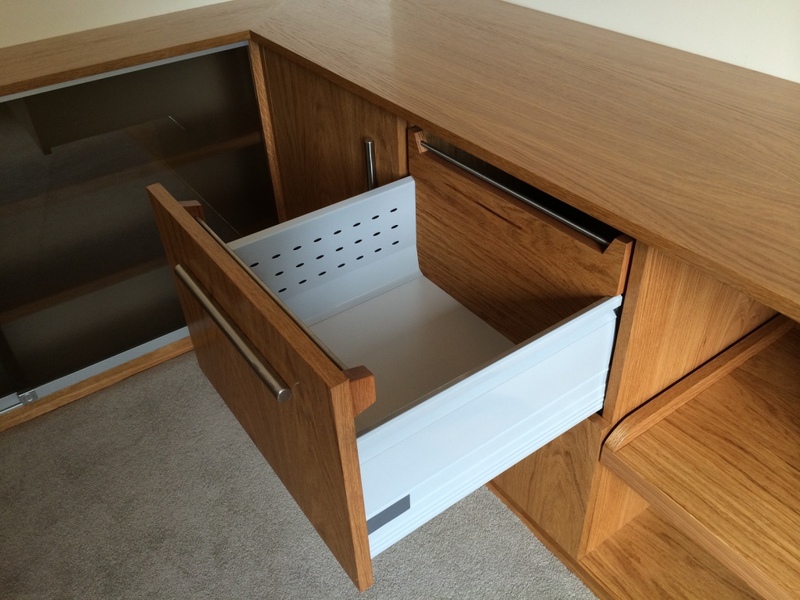 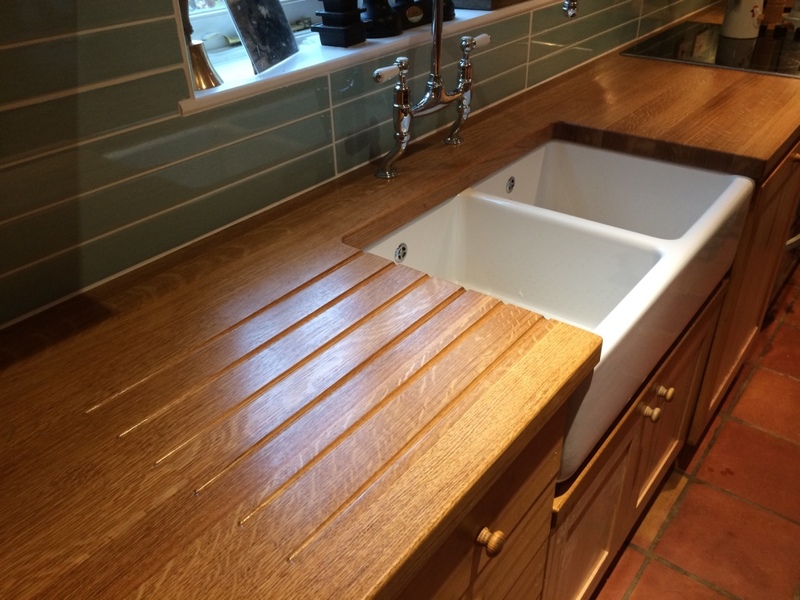 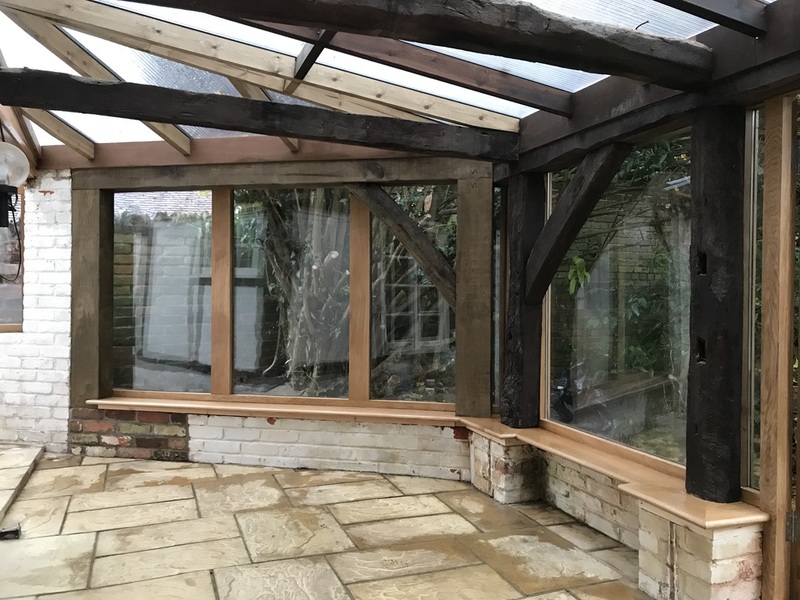 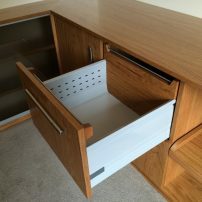 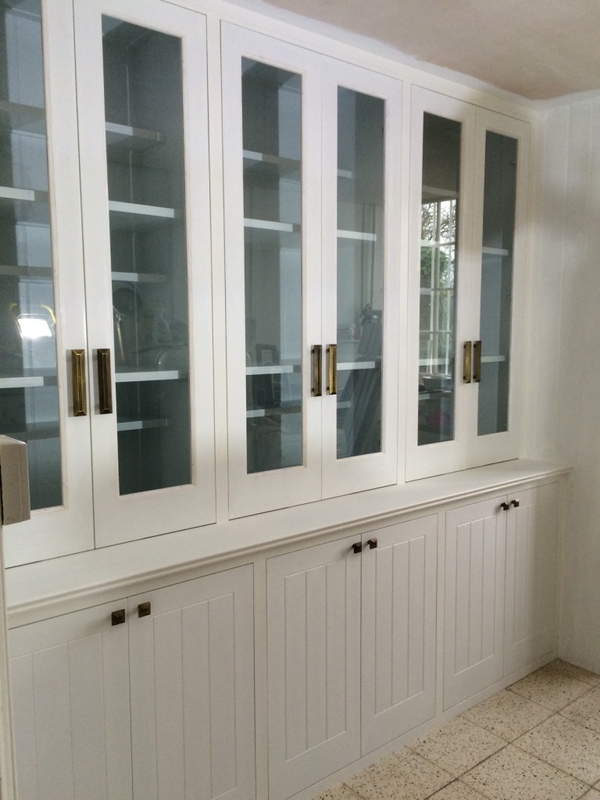 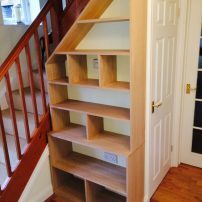 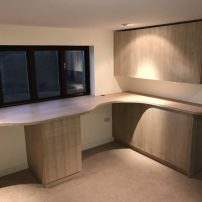 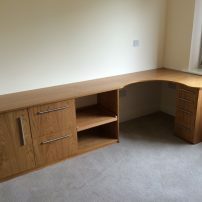 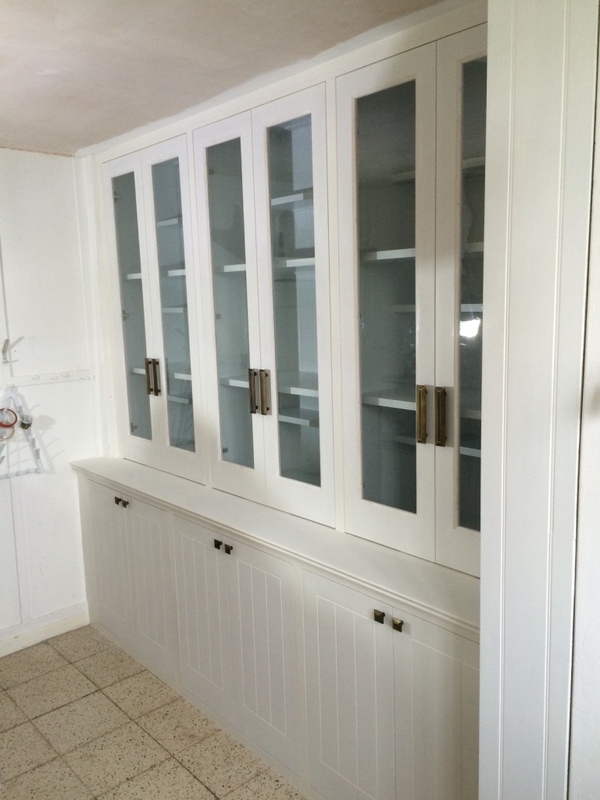 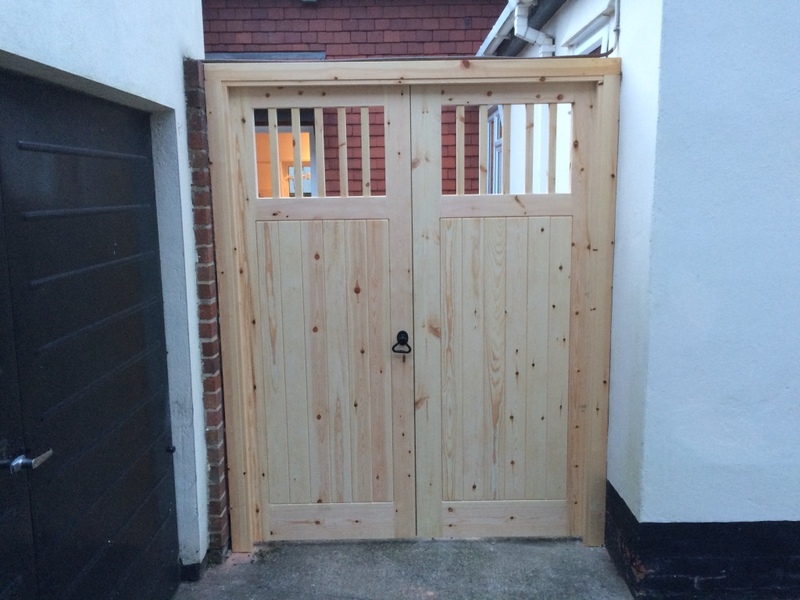 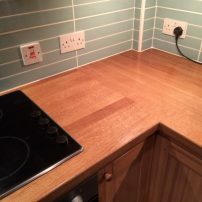 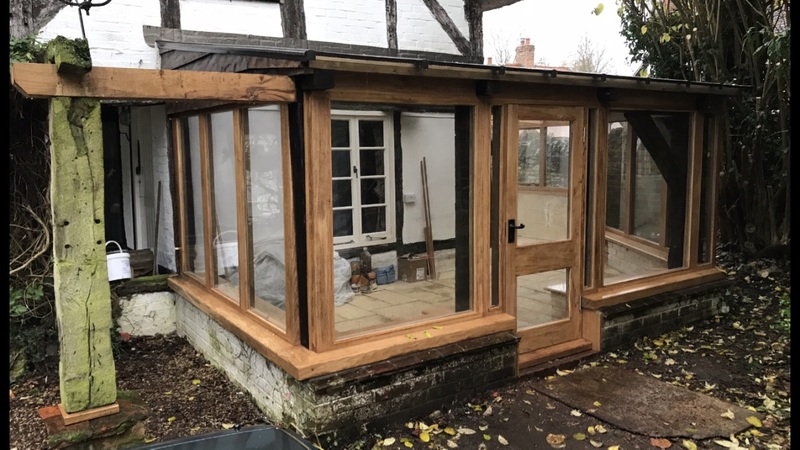 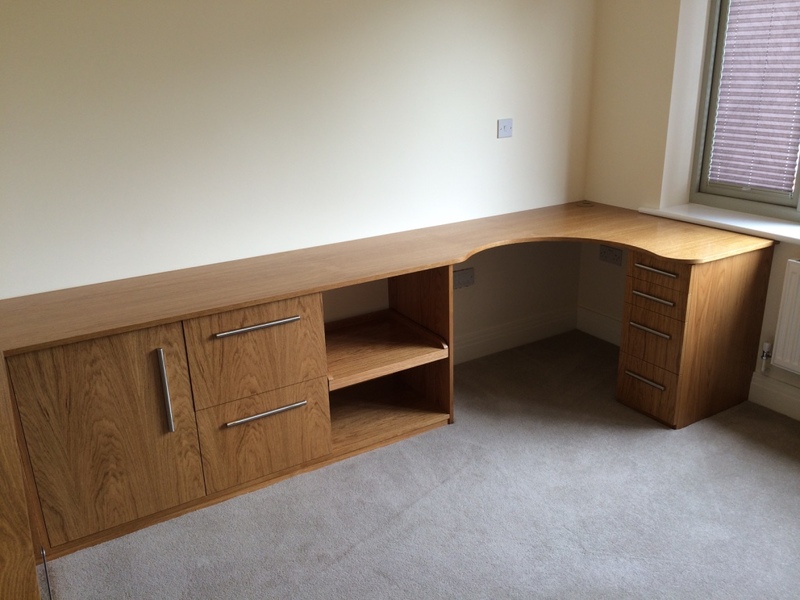 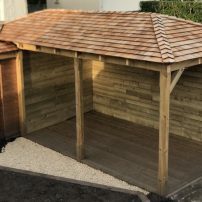 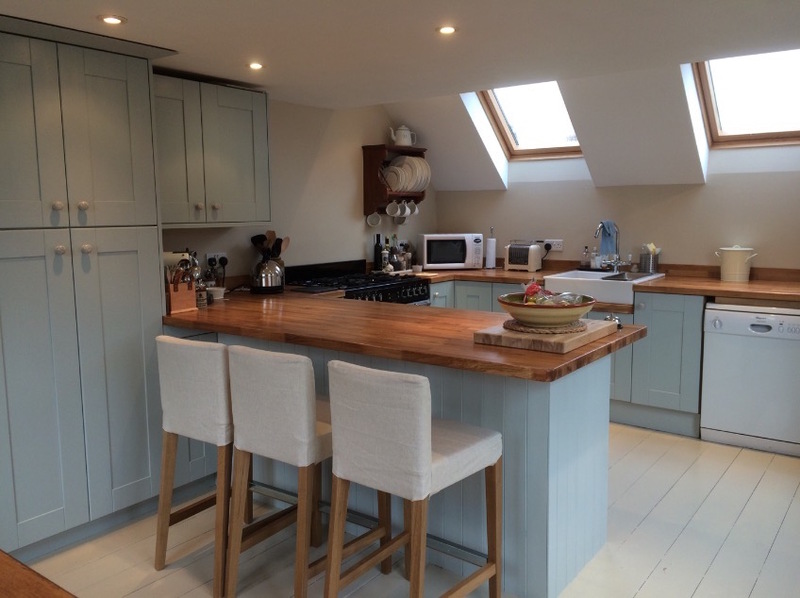 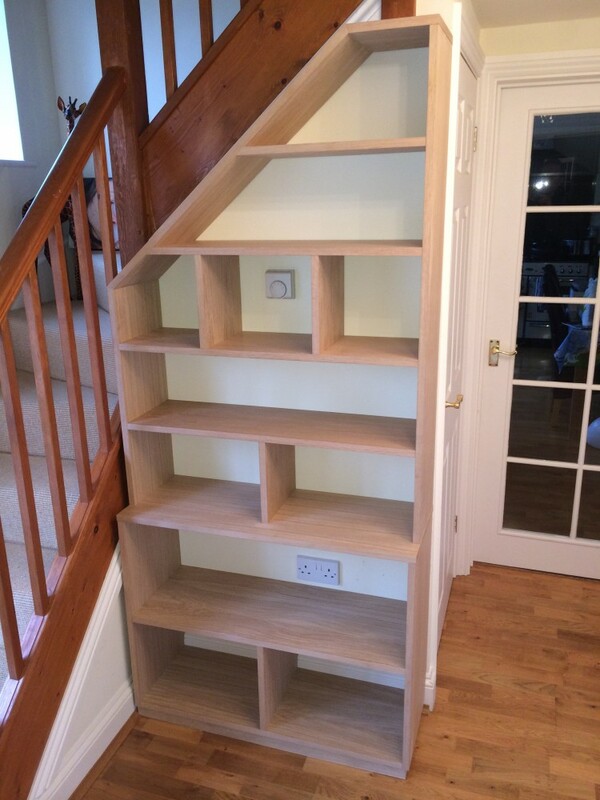 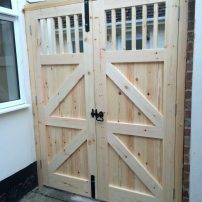 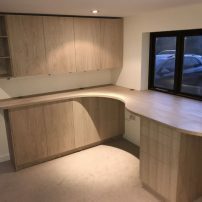 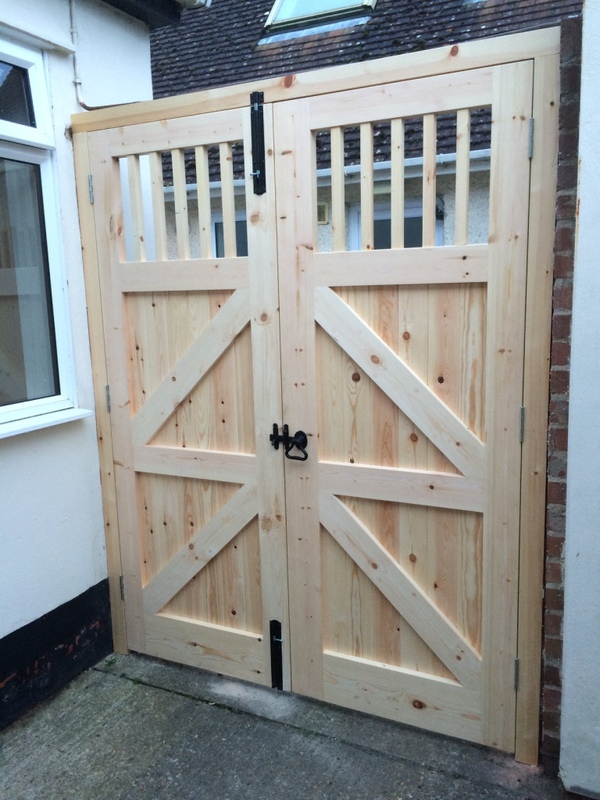 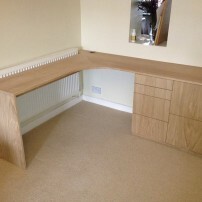 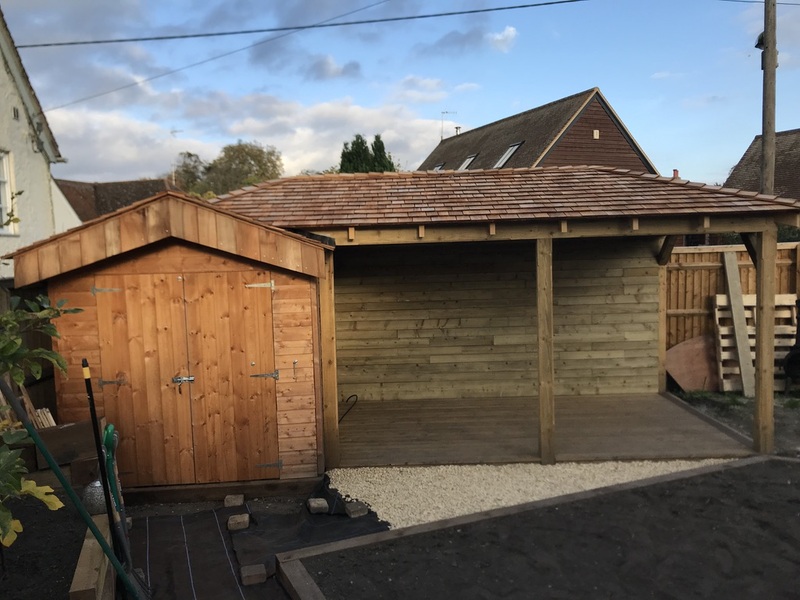 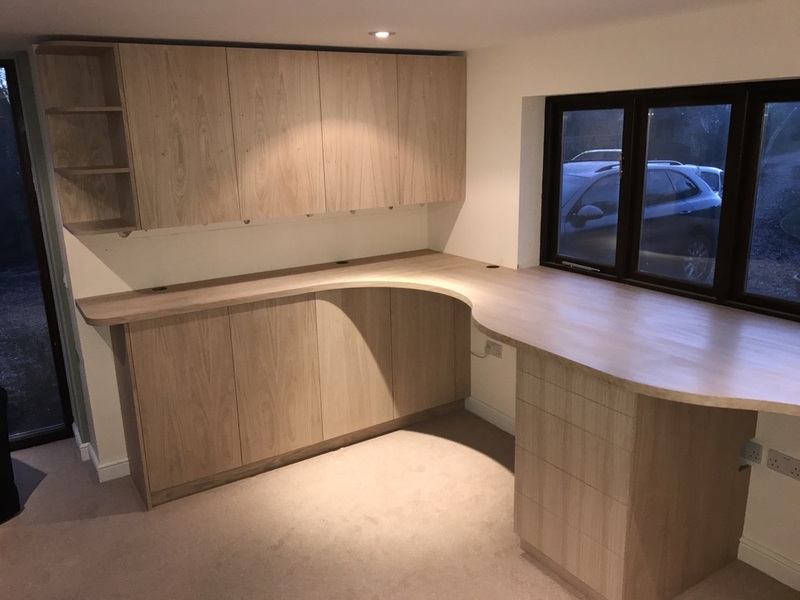 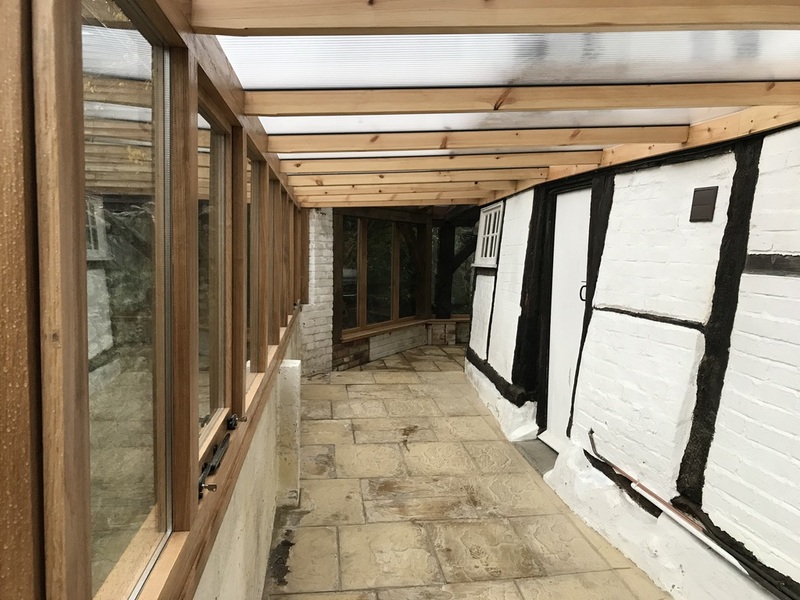 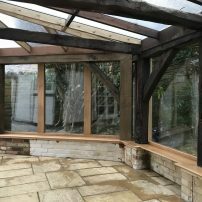 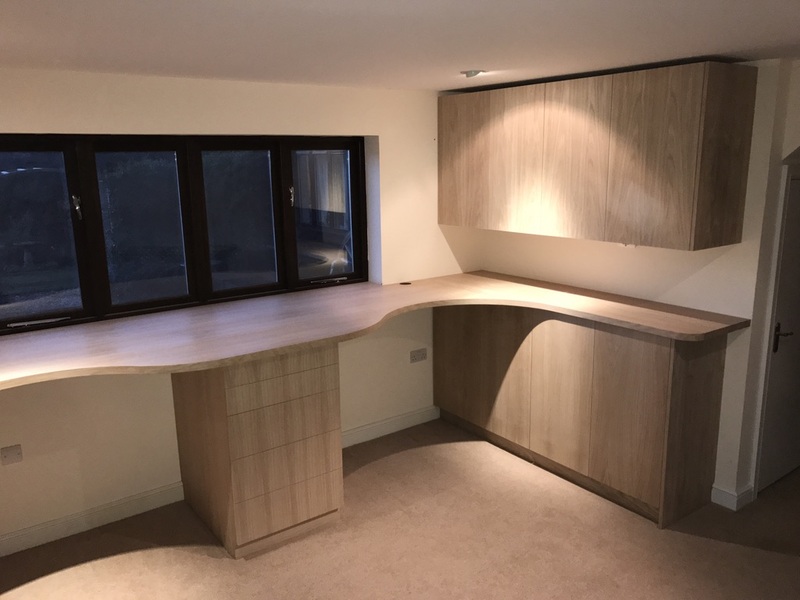 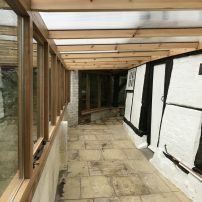 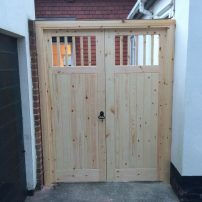 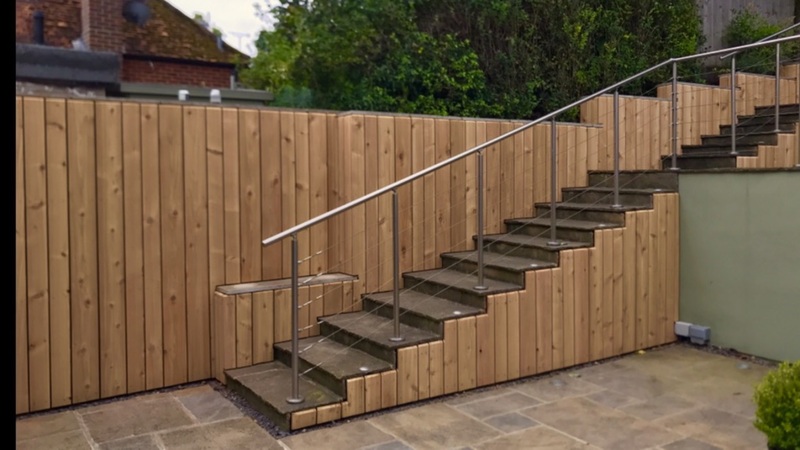 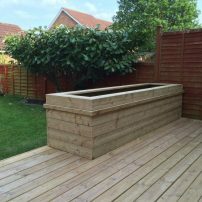 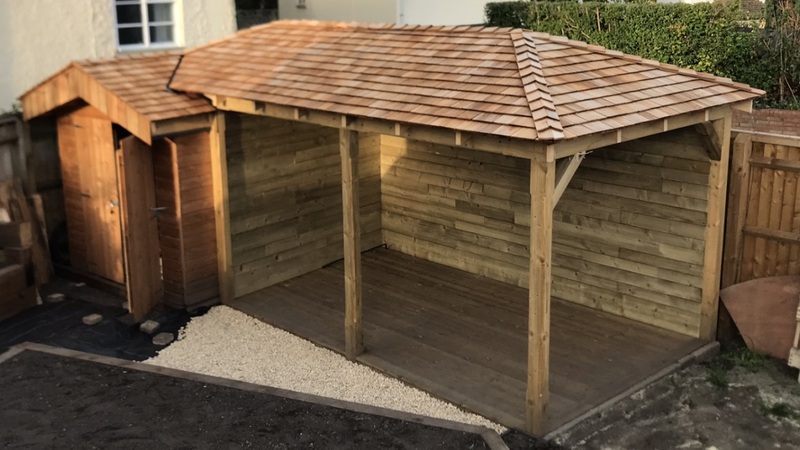 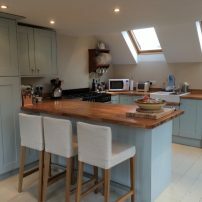 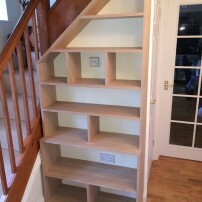 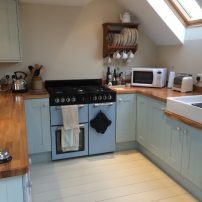 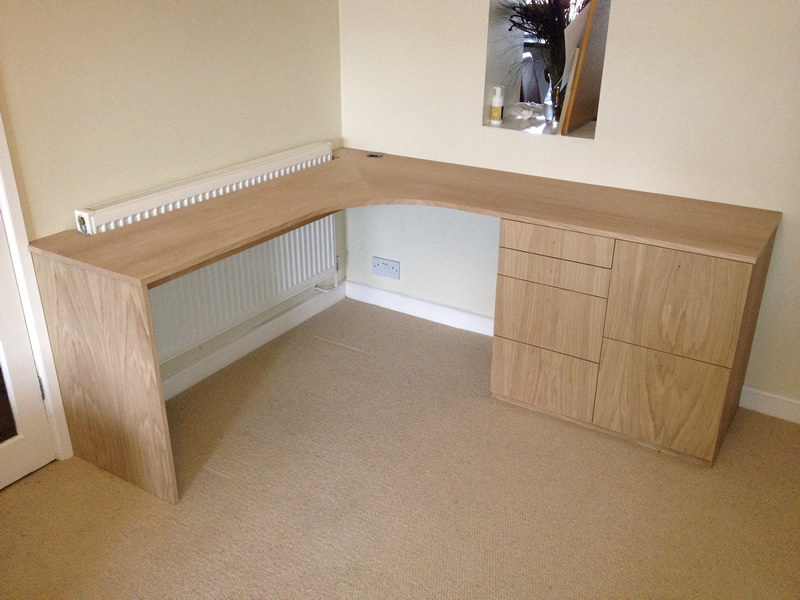 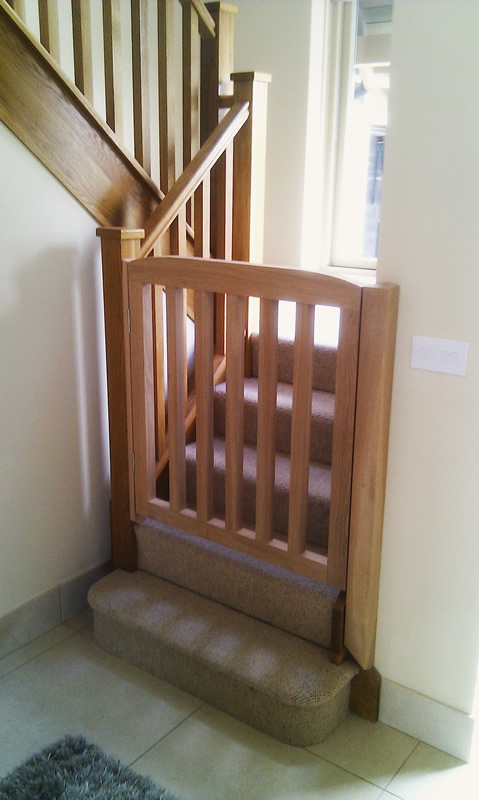 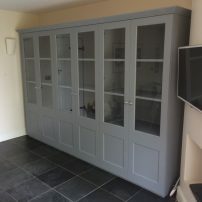 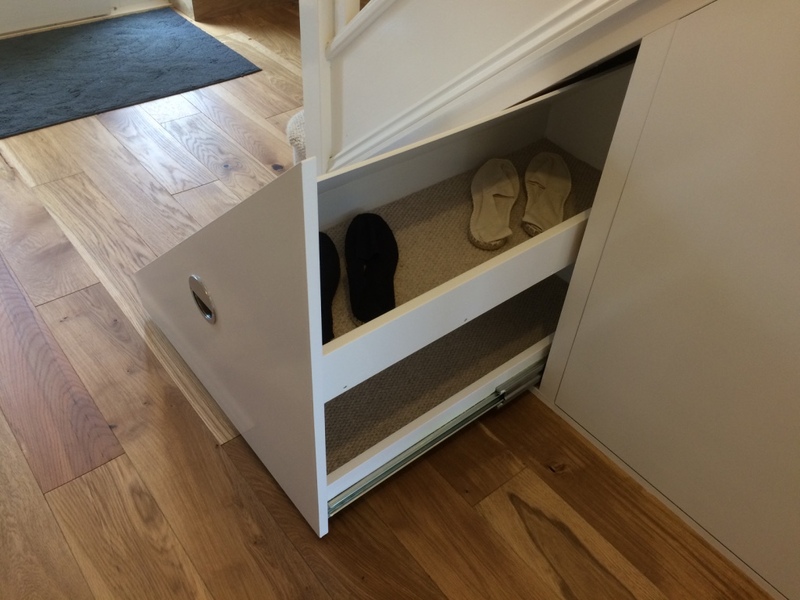 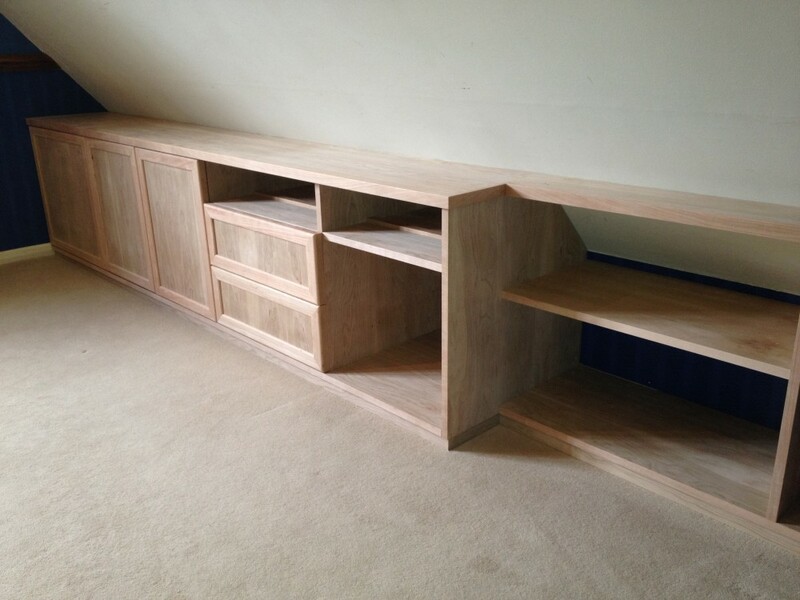 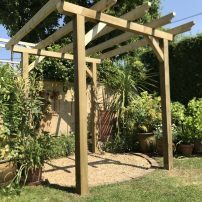 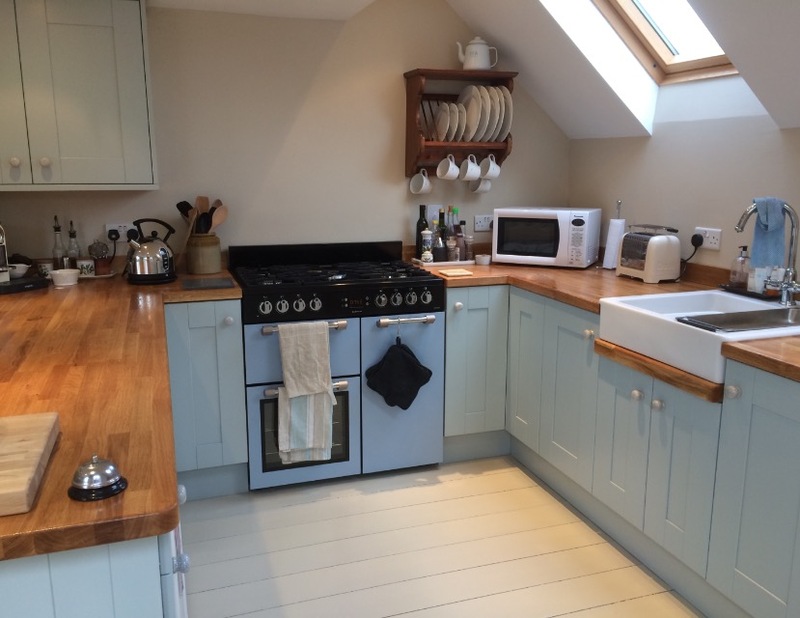 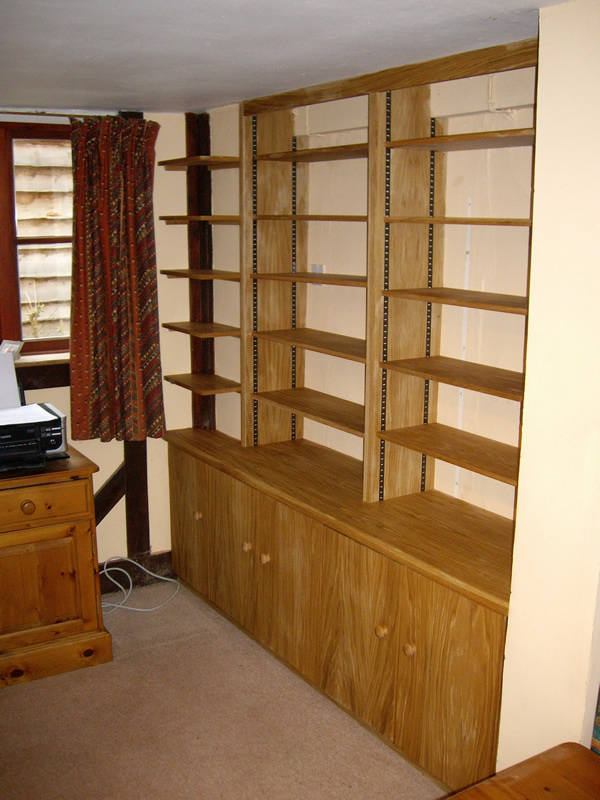 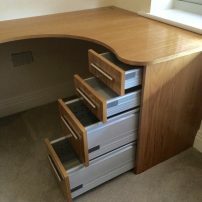 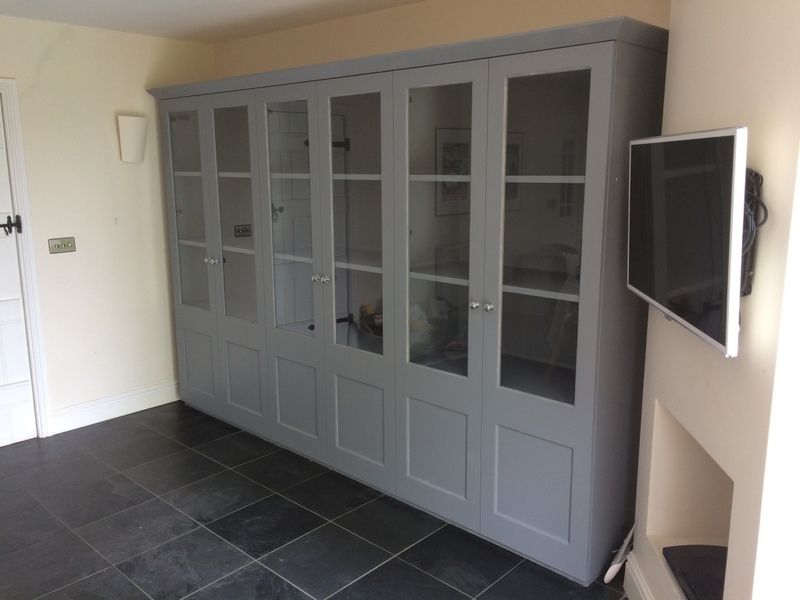 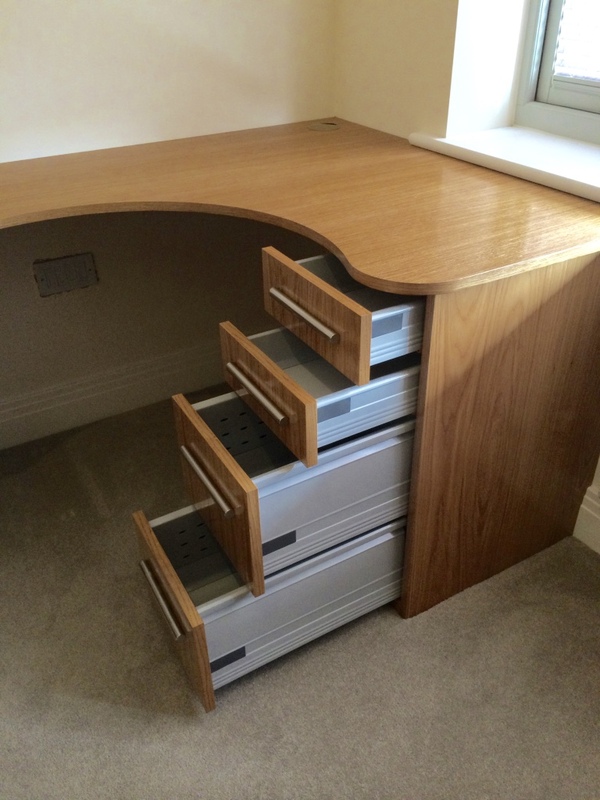 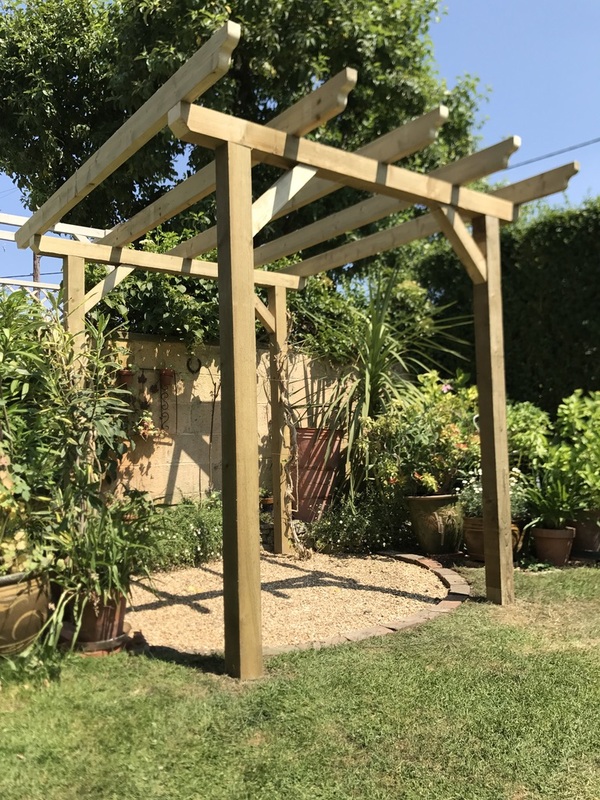 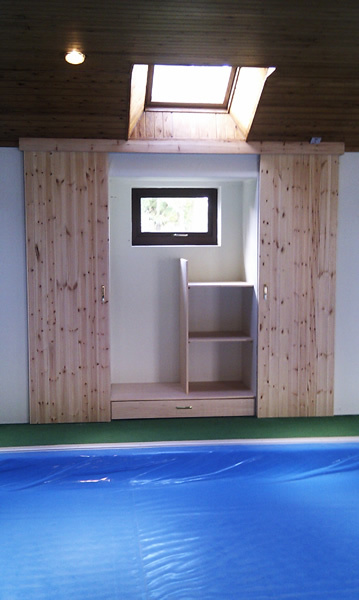 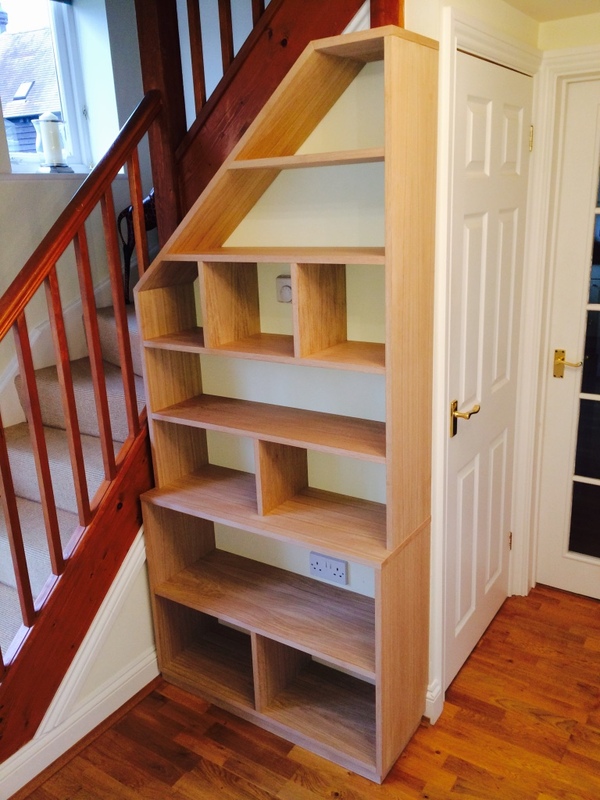 Based in Abingdon, serving the Didcot, Abingdon and Oxfordshire area, we have 20 years of carpentry and joinery experience, producing quality pieces which stand the test of time. 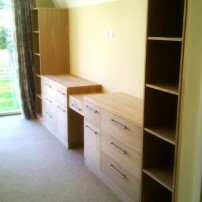 From first contact we were very impressed with Darren’s professionalism & obvious pride in his work. 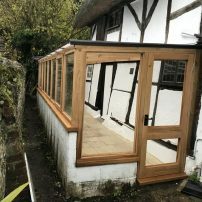 Darren not only has the expertise to do a first rate job but also has the confidence & skill to suggest modifications & improvements to the design brief, involving us in the process throughout. 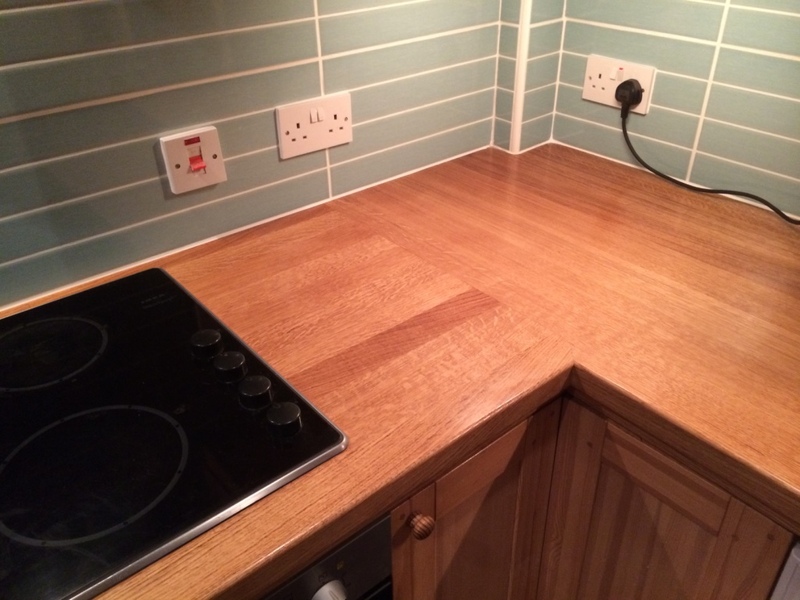 The end result was much better than we had hoped. 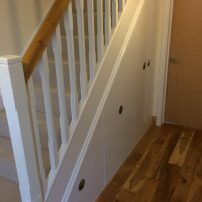 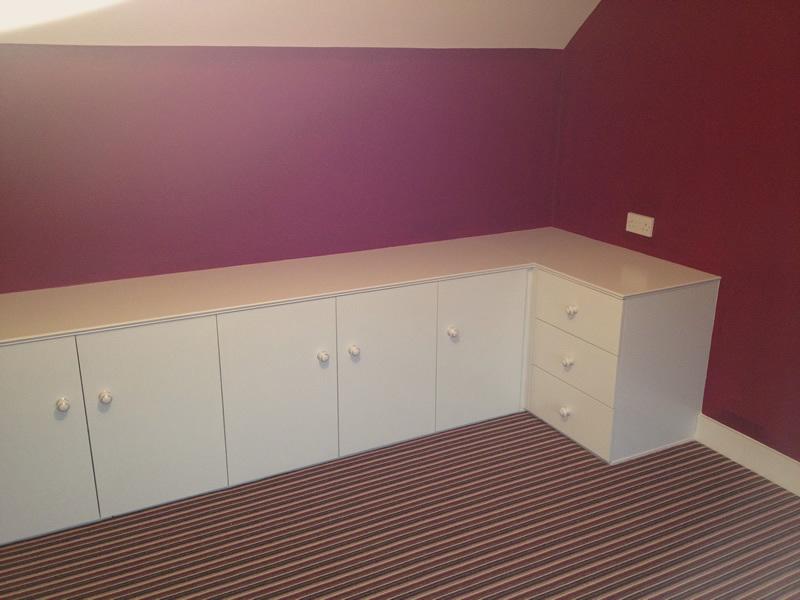 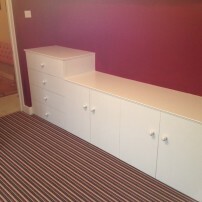 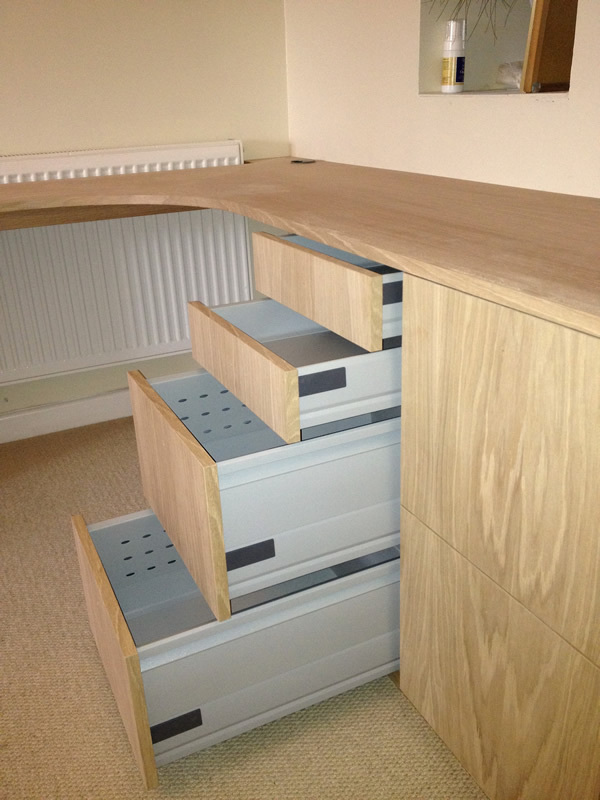 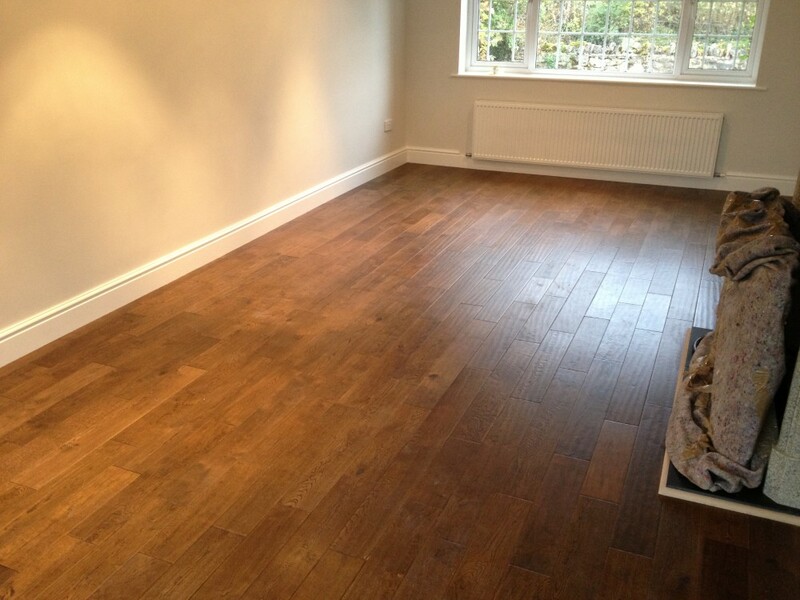 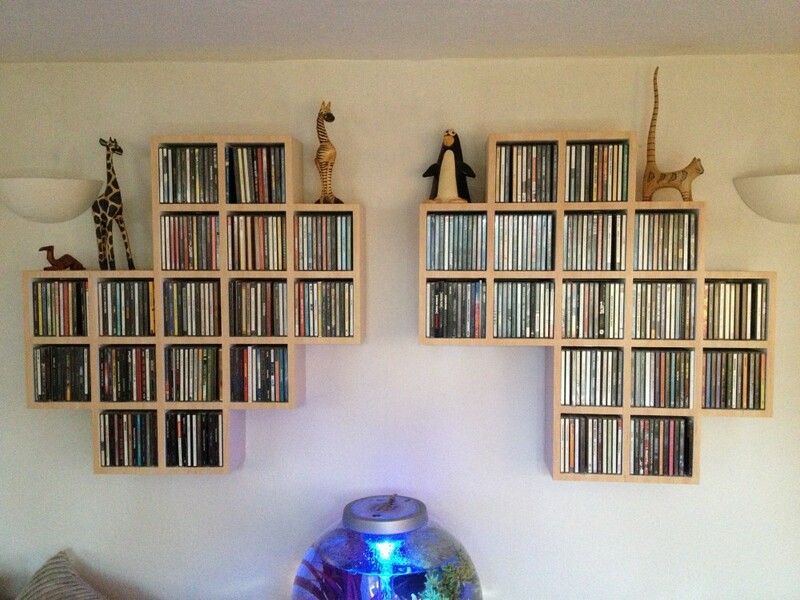 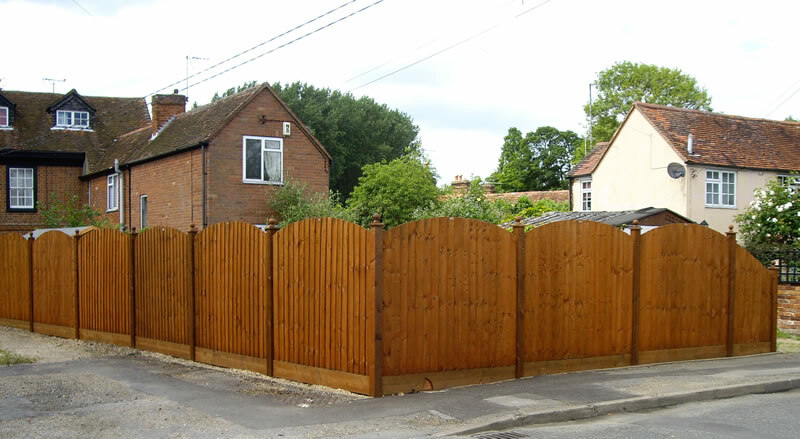 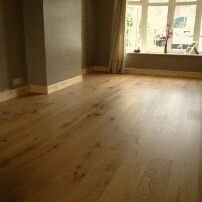 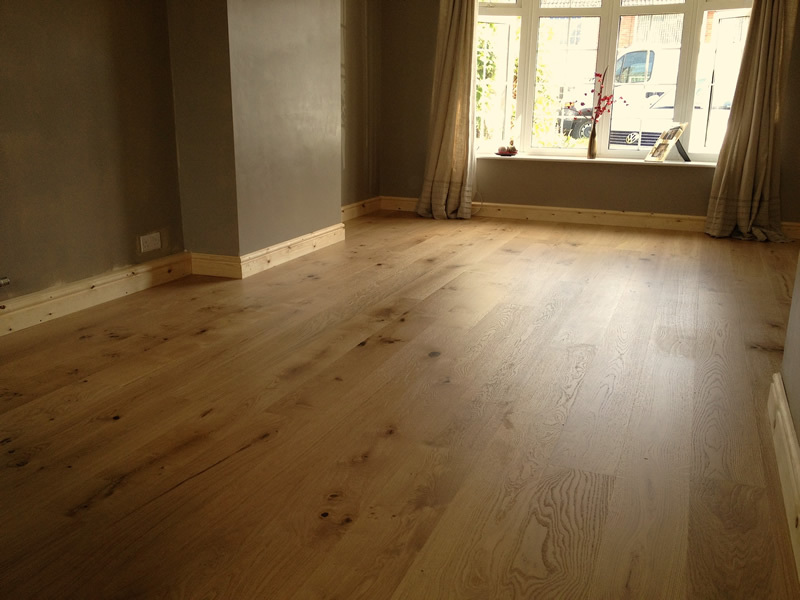 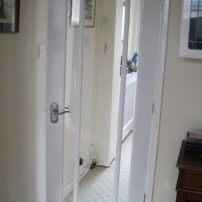 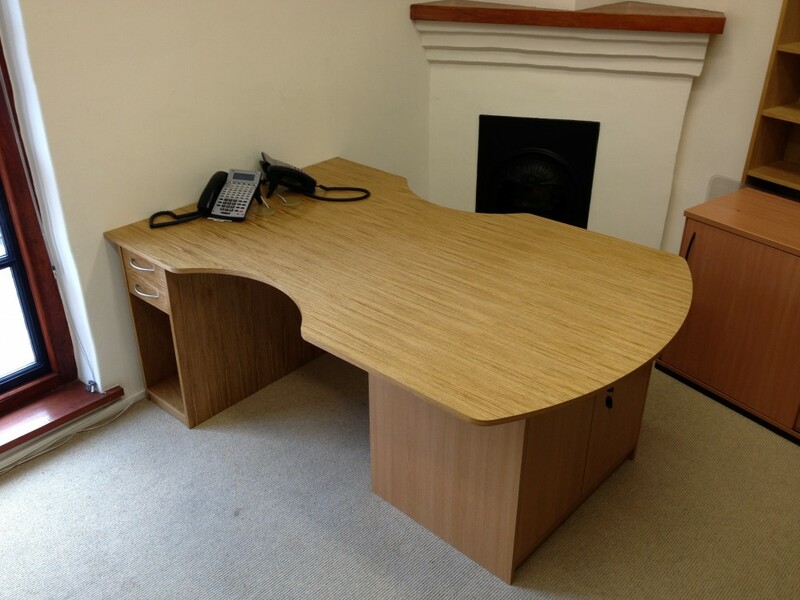 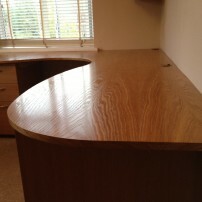 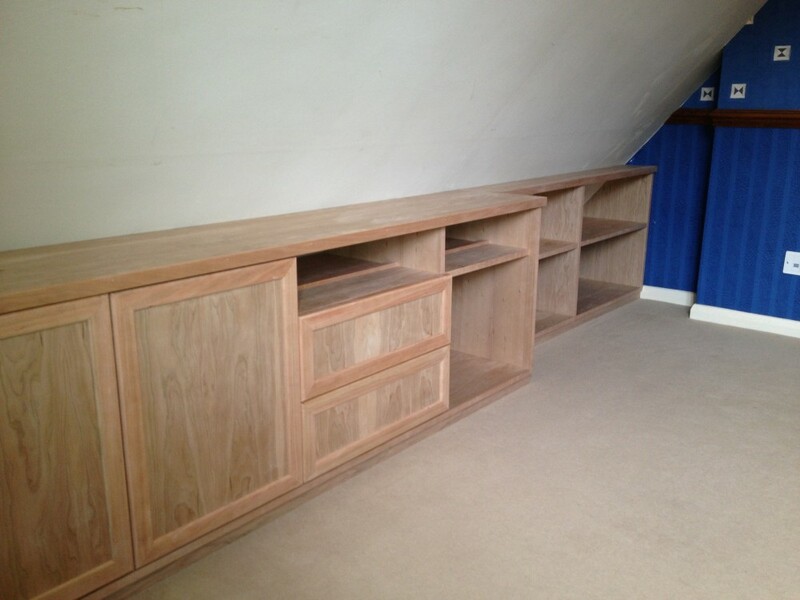 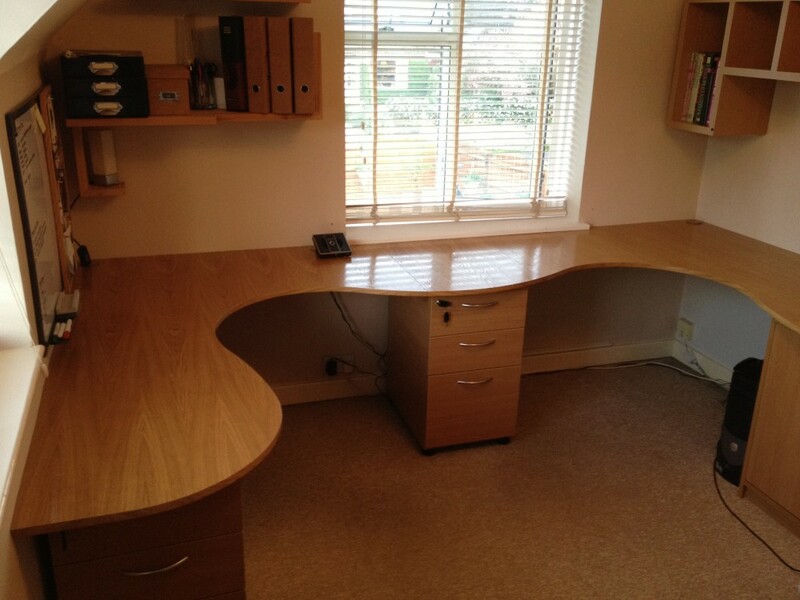 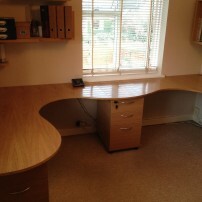 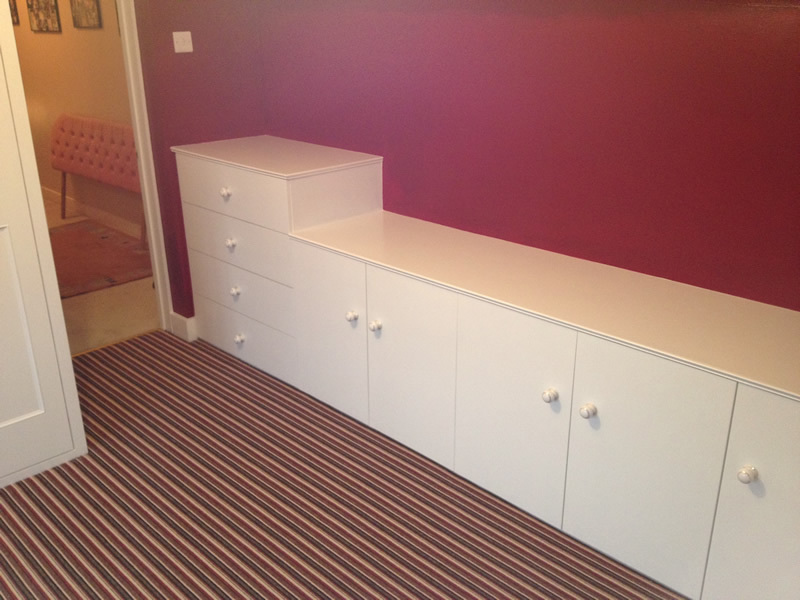 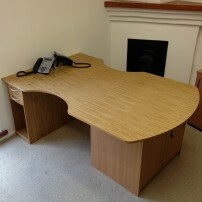 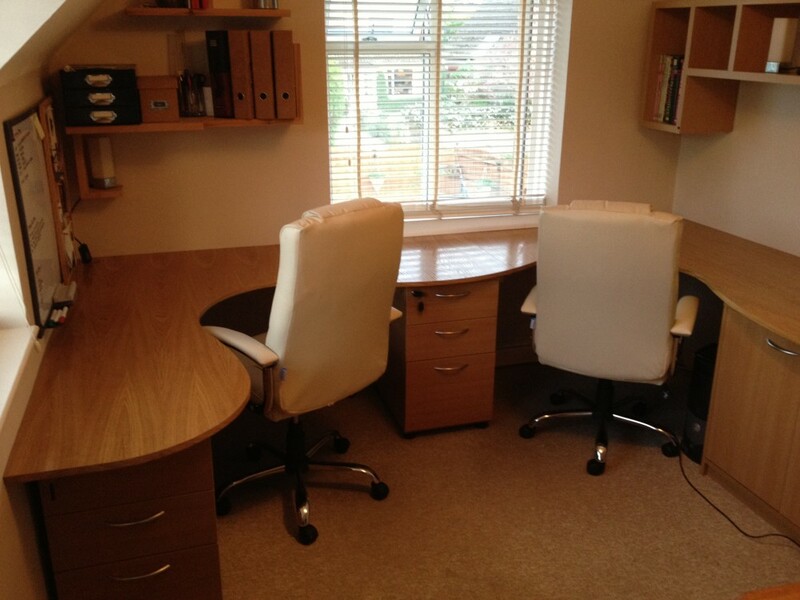 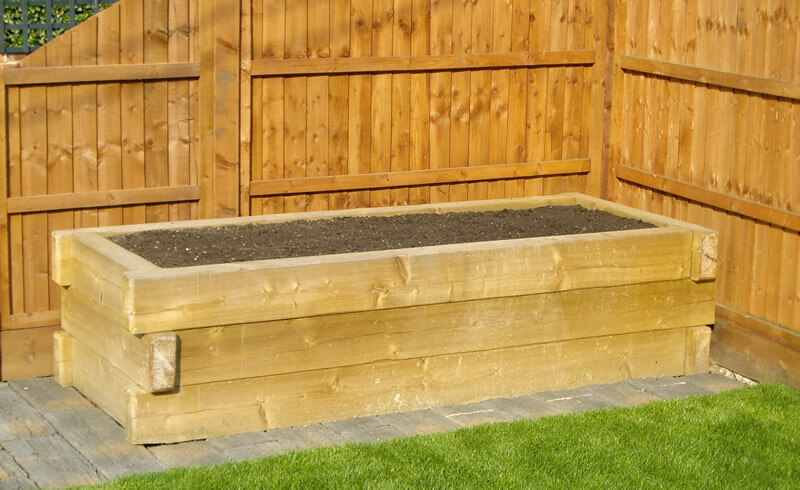 Darren’s workmanship is excellent & we would recommend him without hesitation. 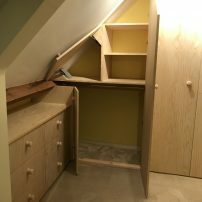 I would recommend his work to anyone. 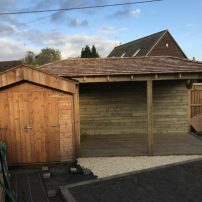 When building our house we relied on a lot of people with various trades but out of all of the people we used I can honestly say that Darren was the most trusted and reliable of them all. 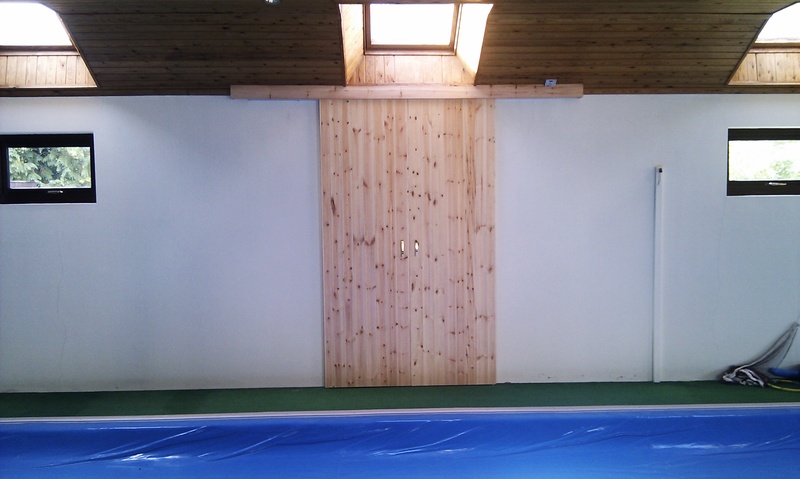 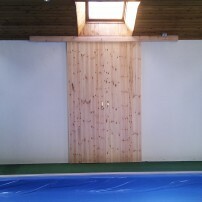 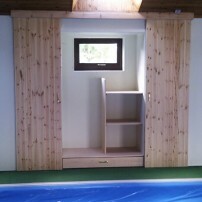 For me he has constructed roofs, field shelters/stables, cupboards and wardrobes. 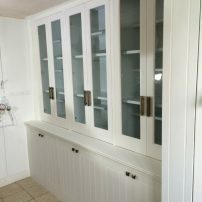 His worked is skilled and if you are at a loss as to how to do something he has the creativity to design something that exceeds your expectations. 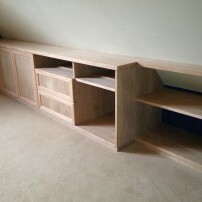 You and your father are a wonderful team and we are both thrilled with the quality and care of your works, with greatful thanks. 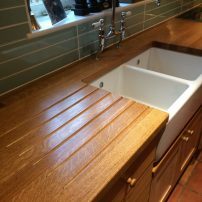 Superior Craftsmanship ..not only arrives on time but the quality of his work is better than first class… Quotes also came in very competitive which helps too! 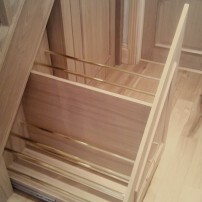 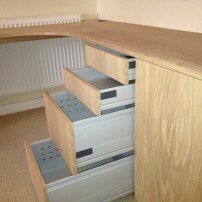 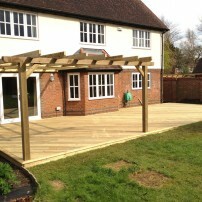 I would definatley recommend Leading Edge for any carpentry work. 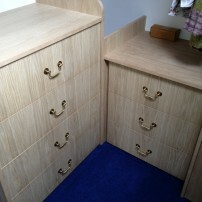 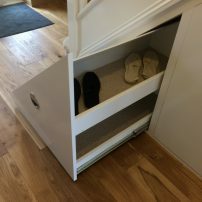 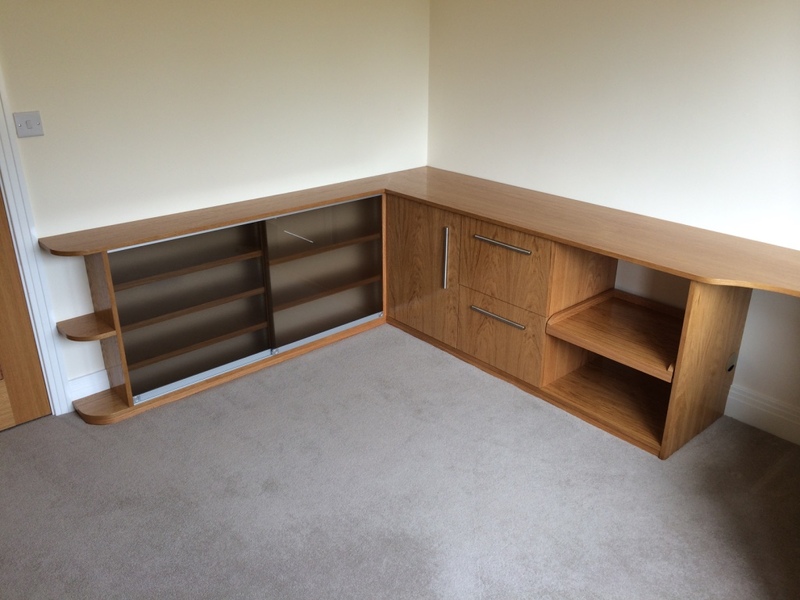 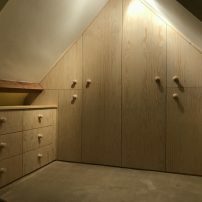 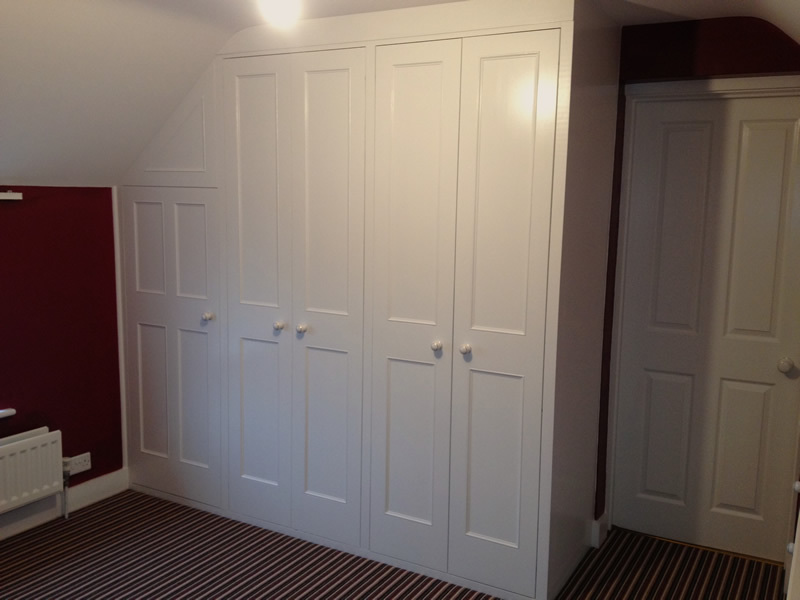 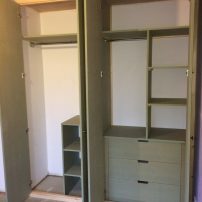 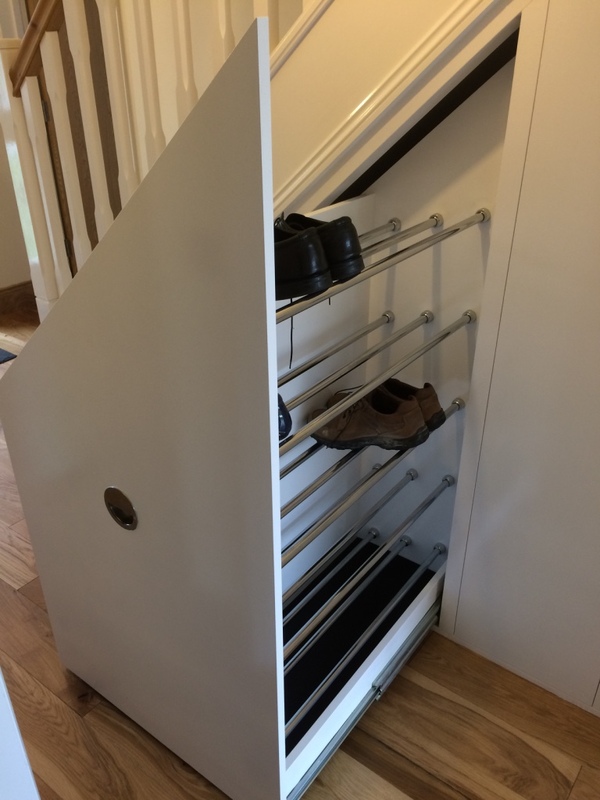 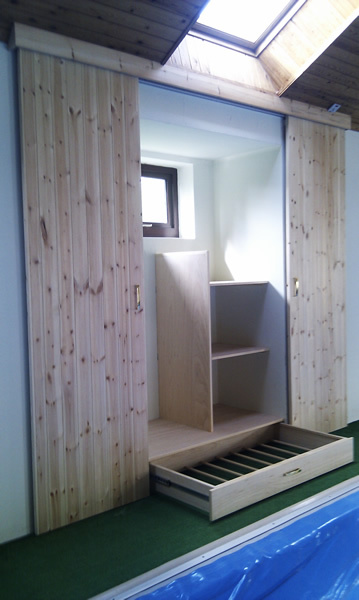 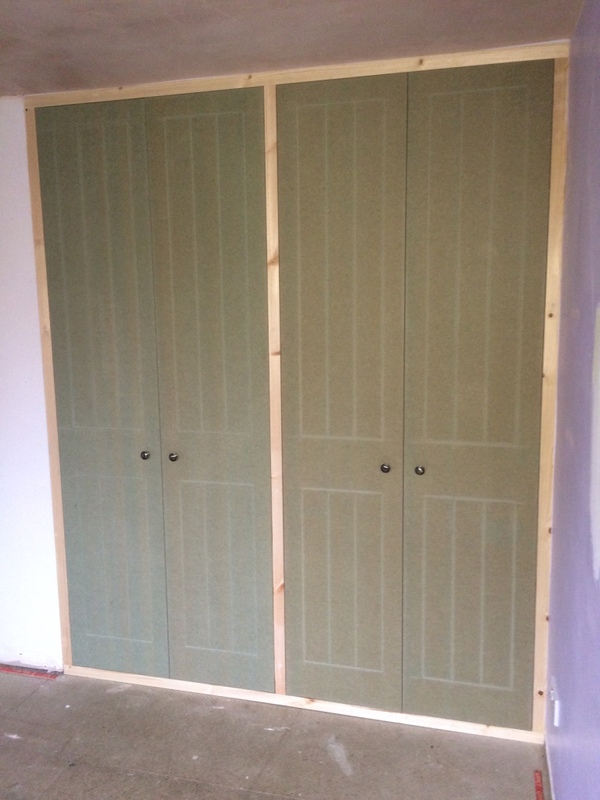 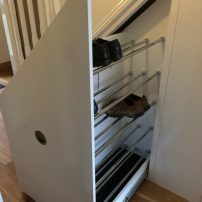 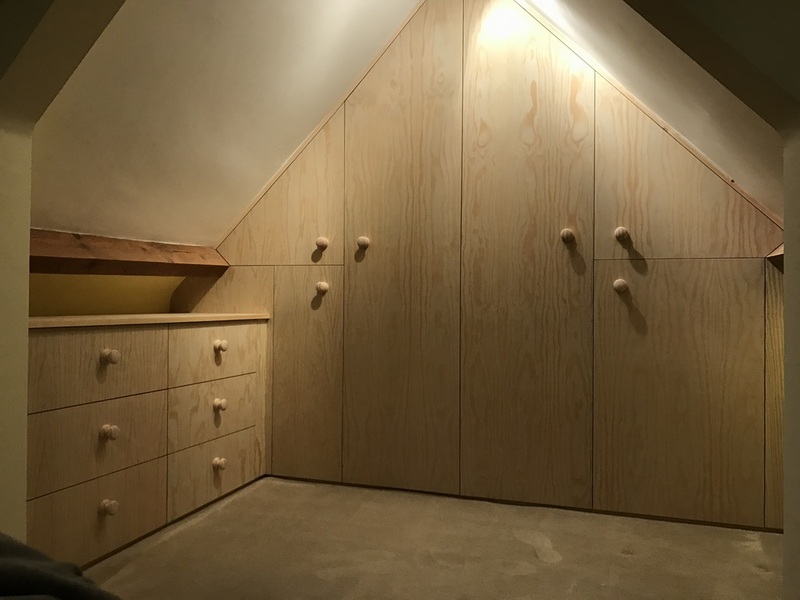 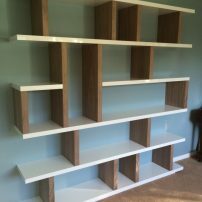 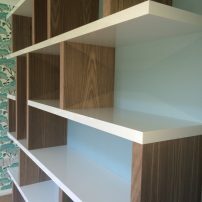 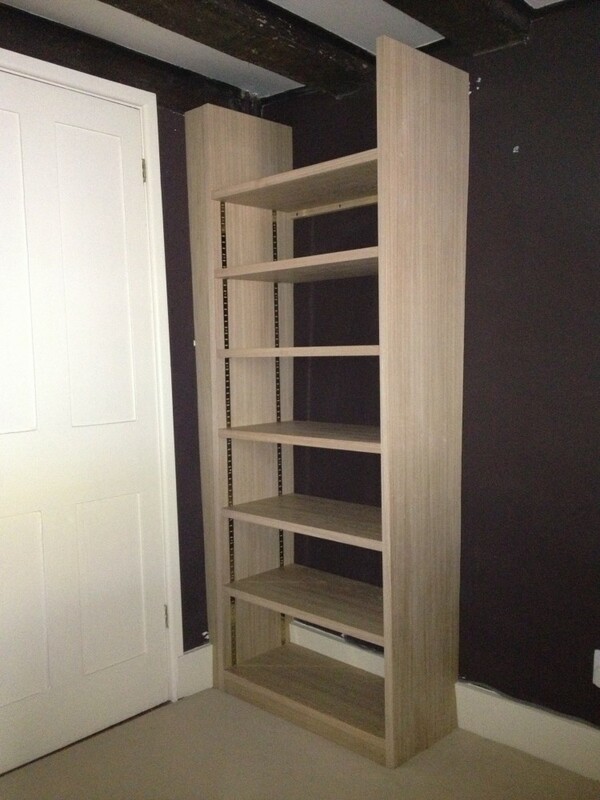 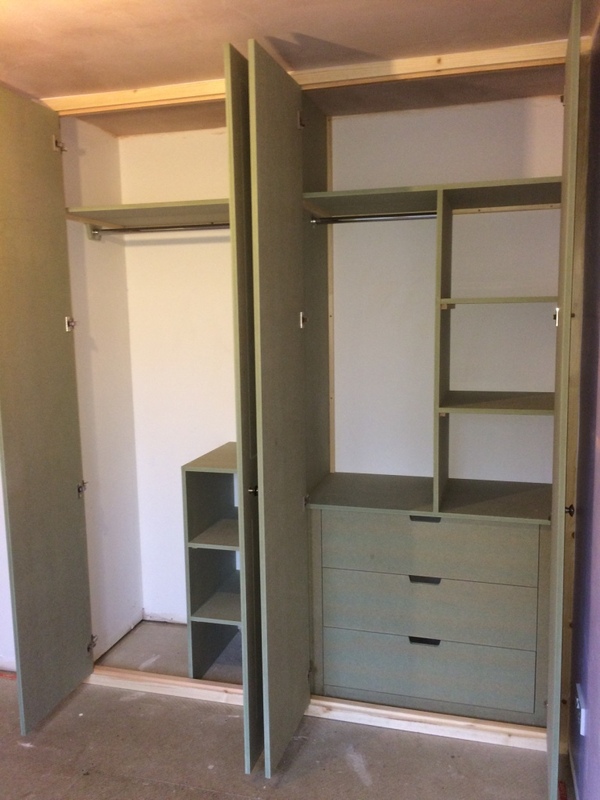 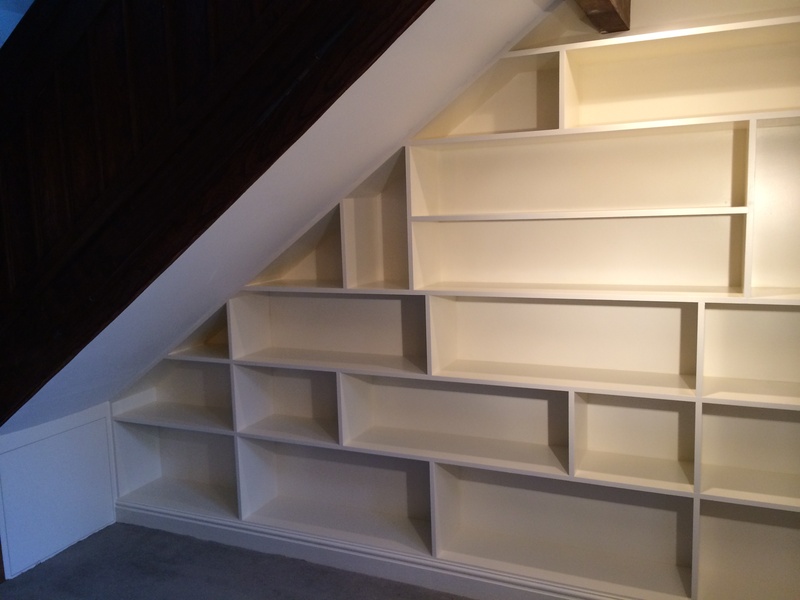 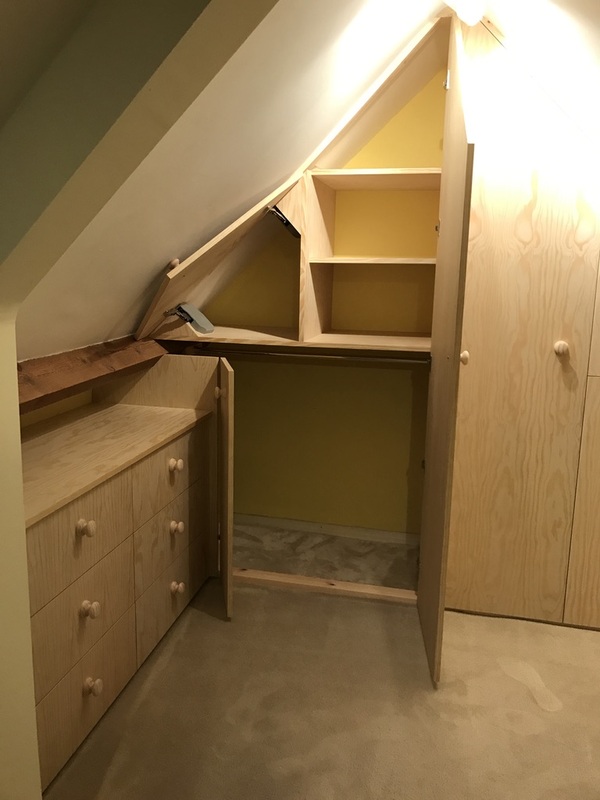 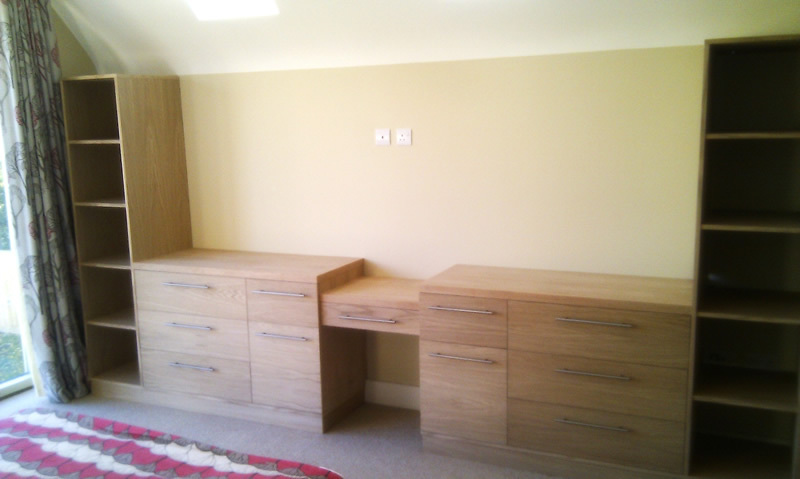 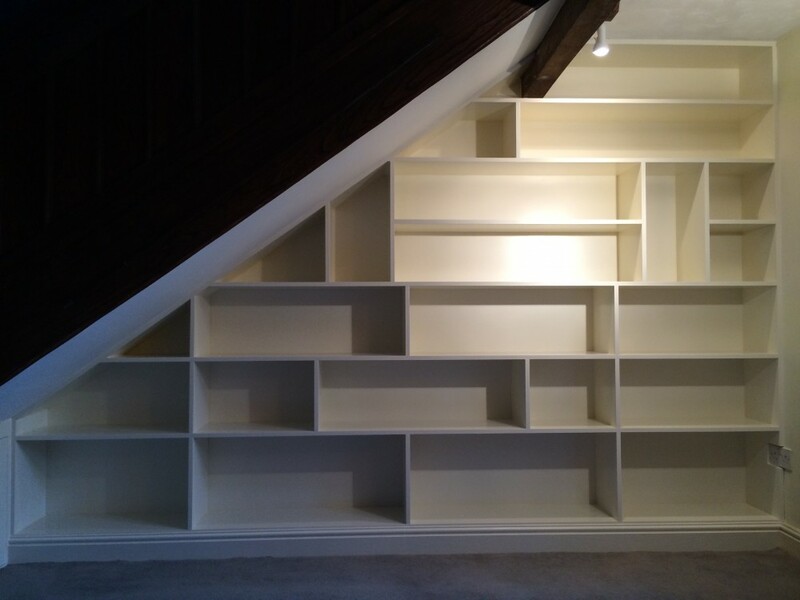 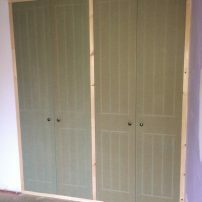 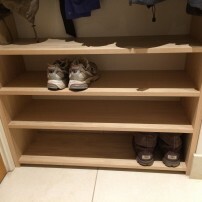 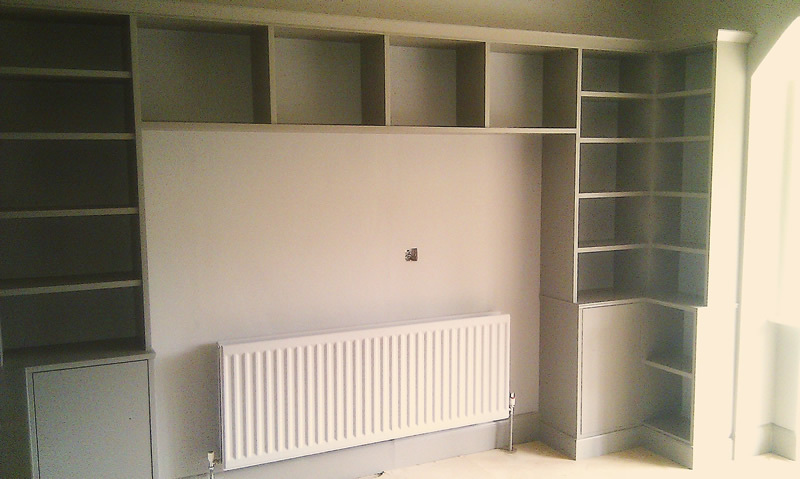 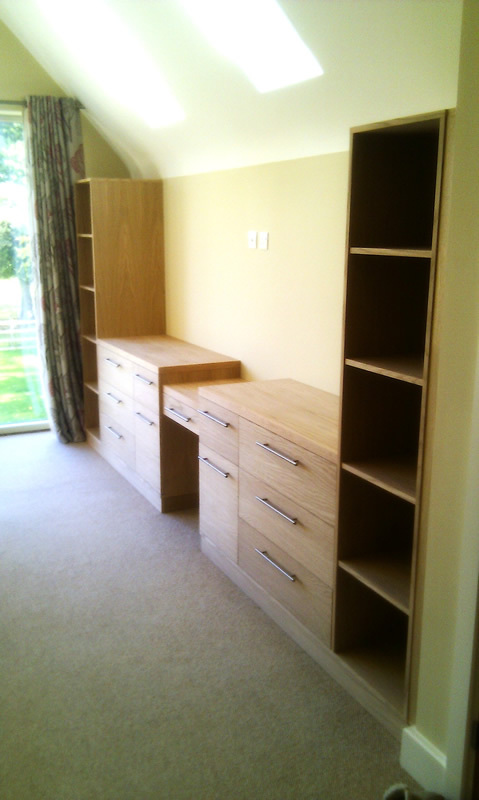 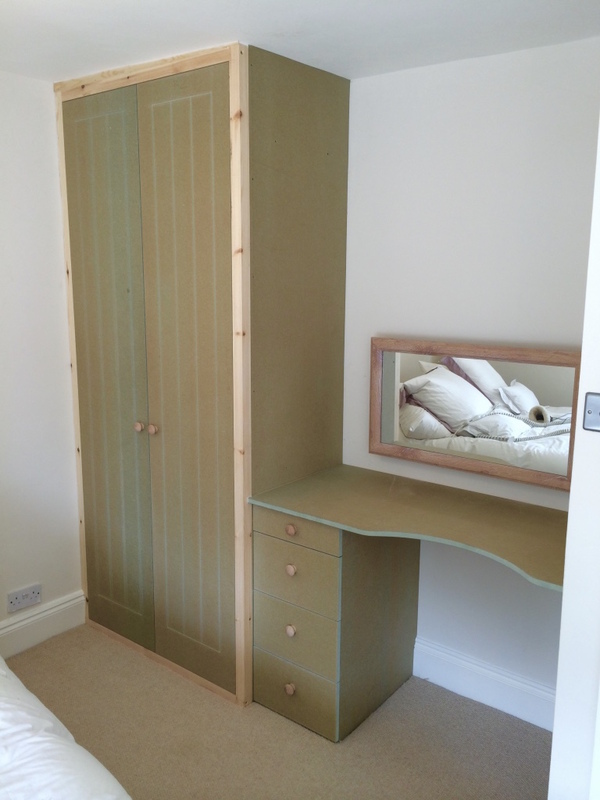 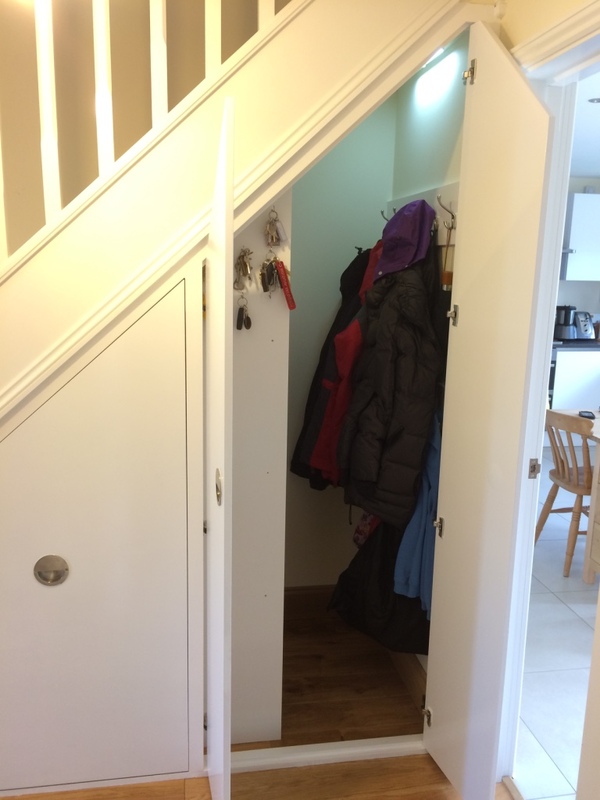 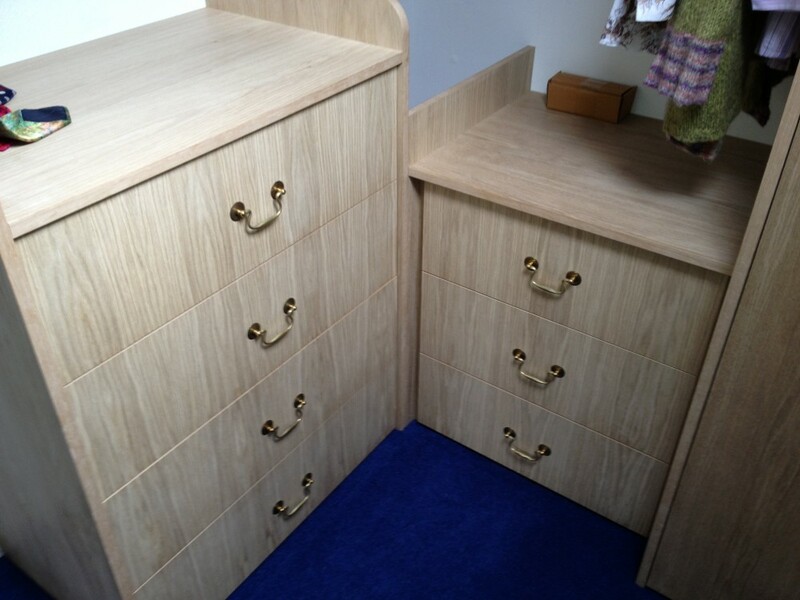 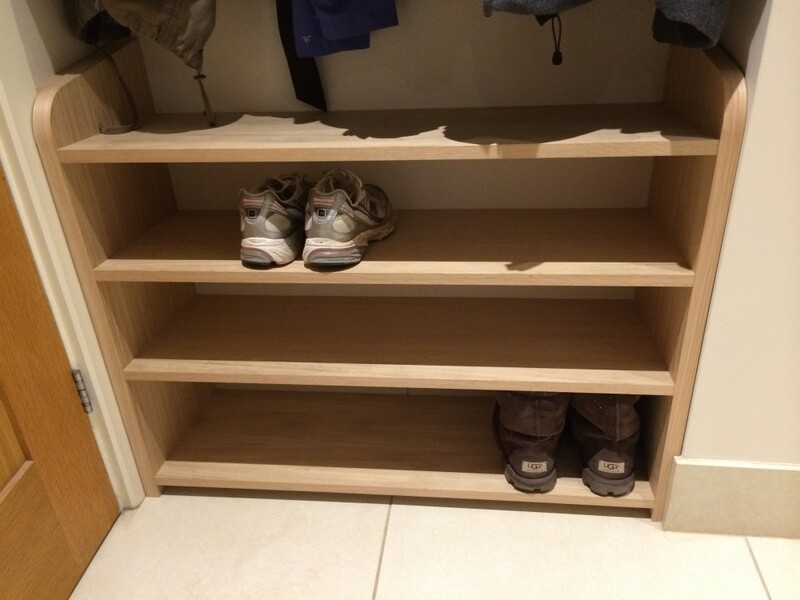 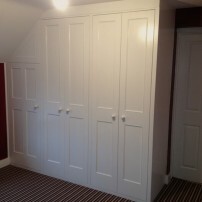 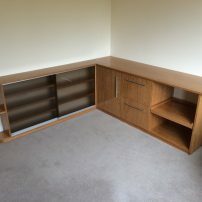 Fully fitted bedroom from scratch – wardrobes , bedside cabinets, other fitted units – A really excellent job – in time, in budget, excellent craftsmanship – thank you very much!!! 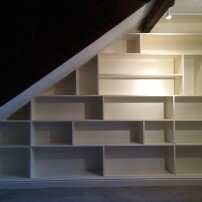 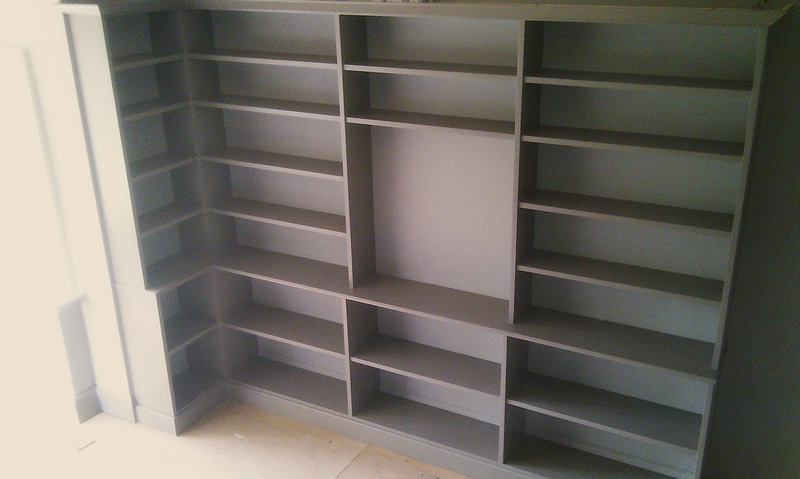 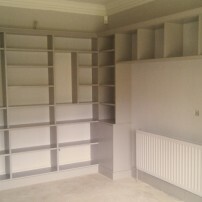 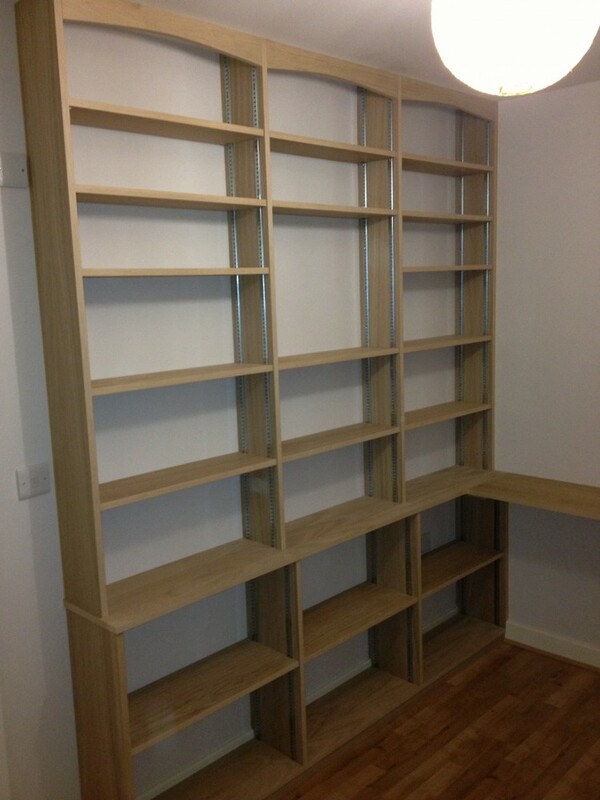 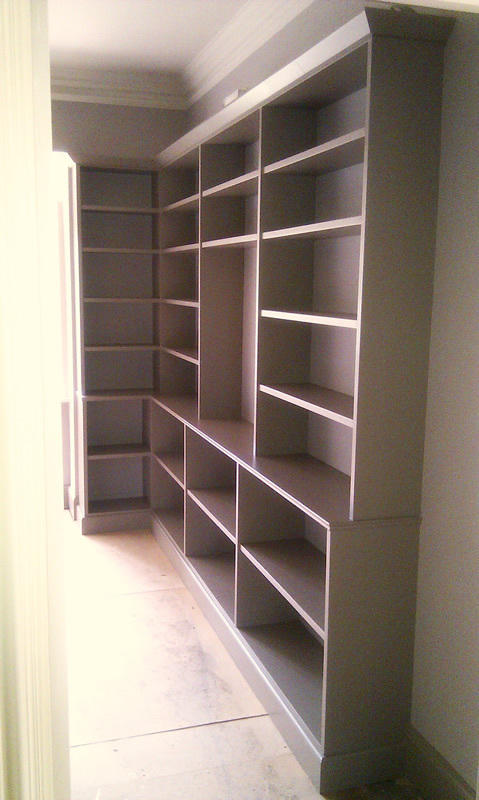 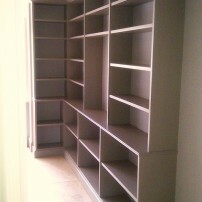 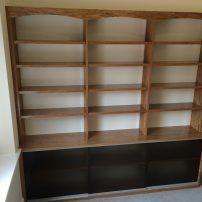 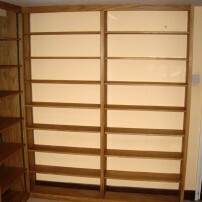 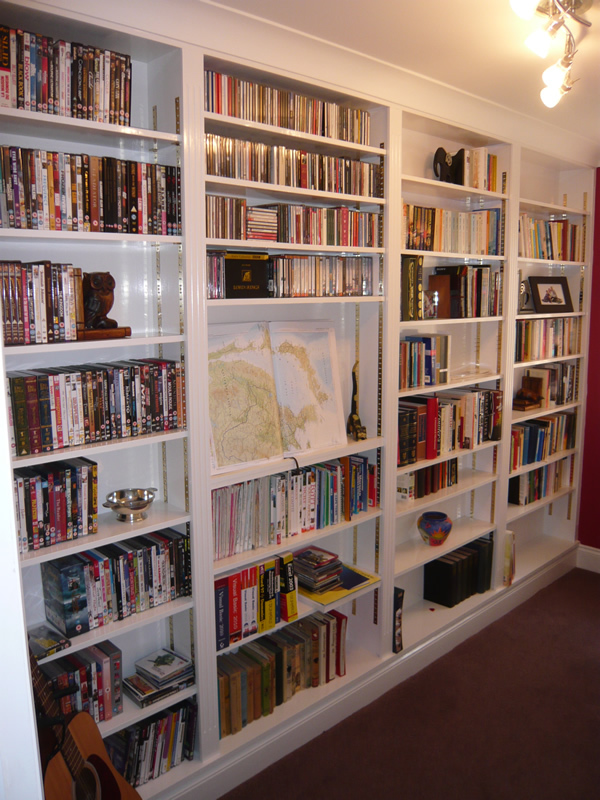 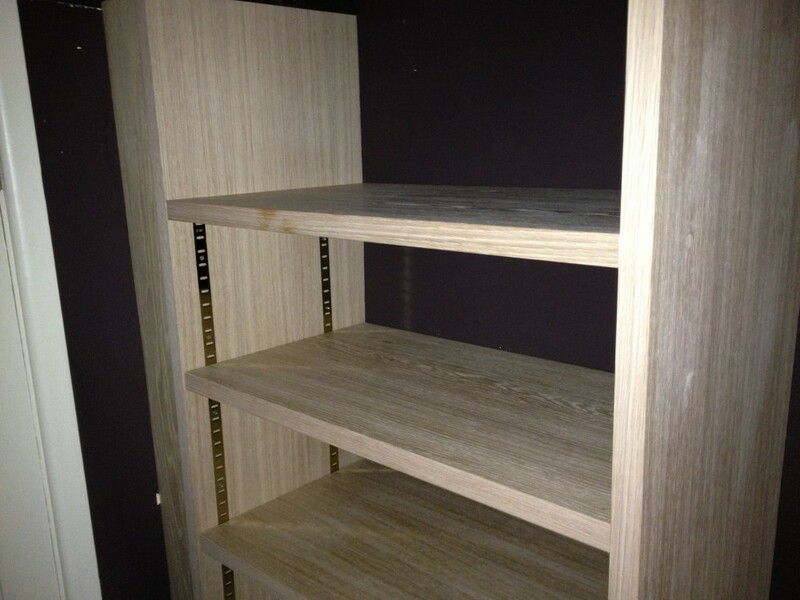 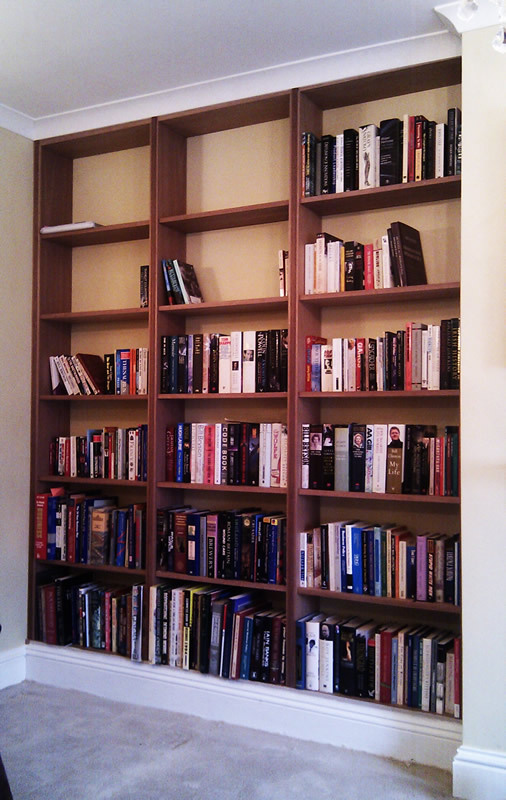 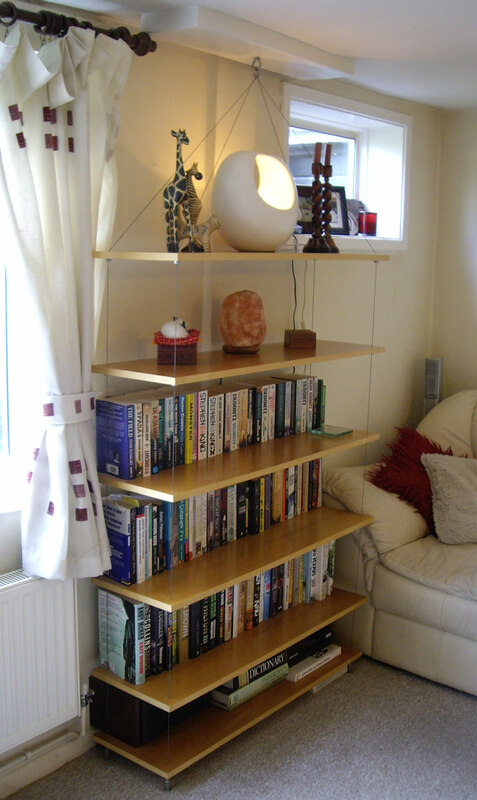 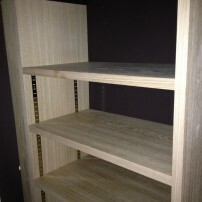 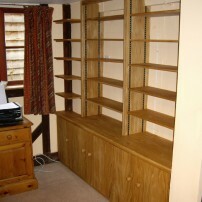 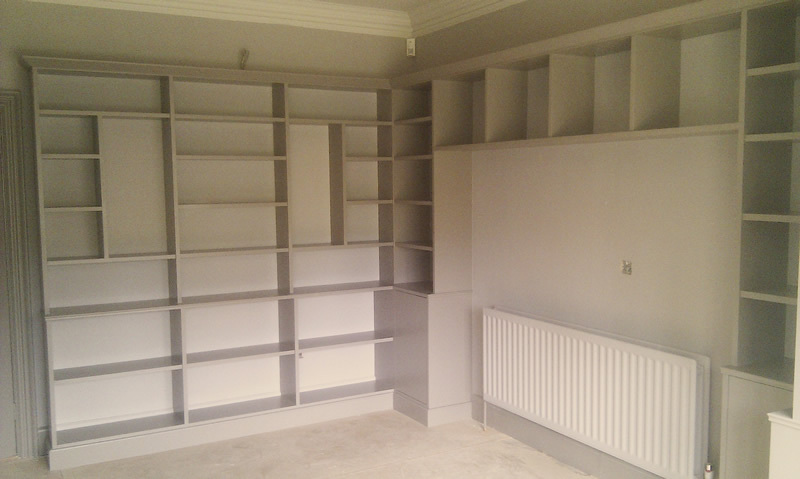 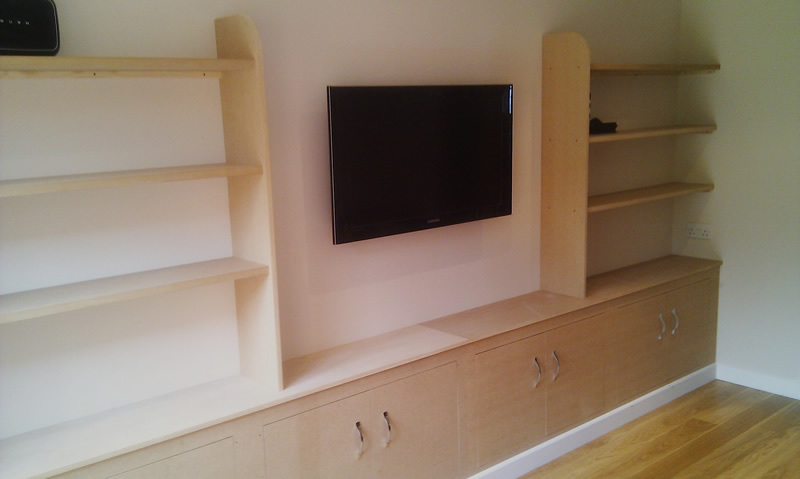 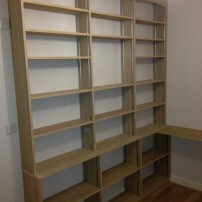 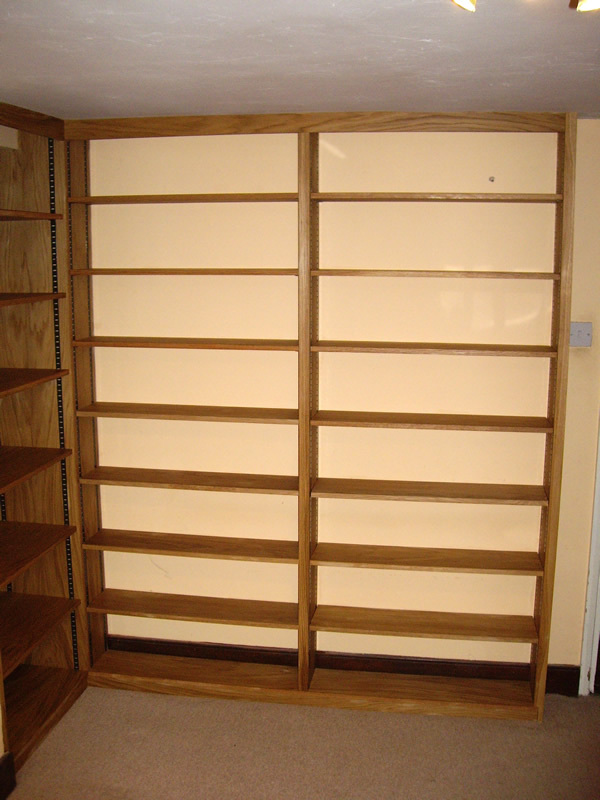 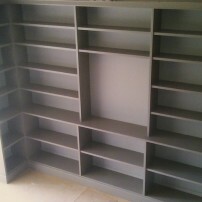 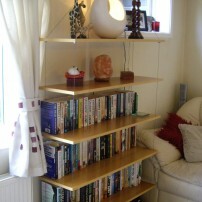 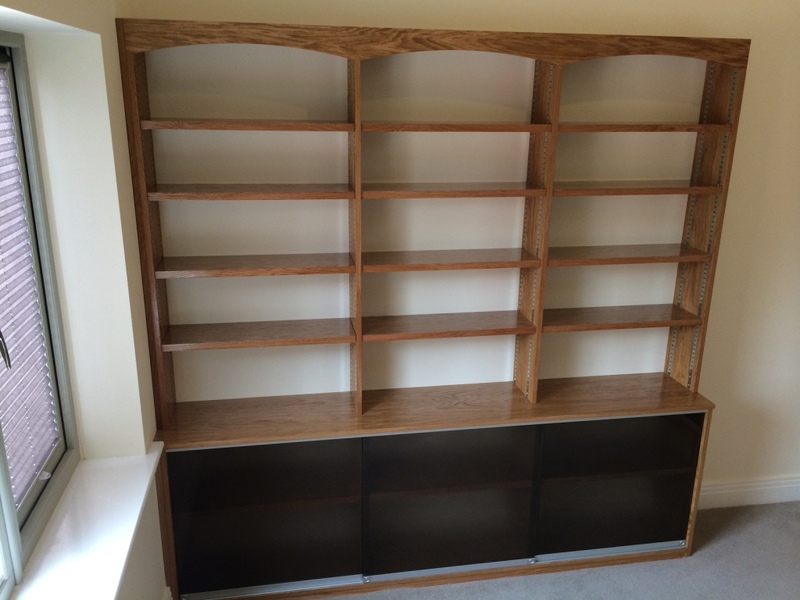 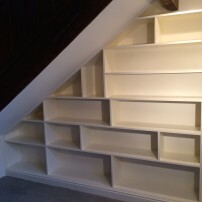 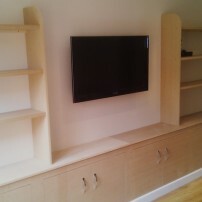 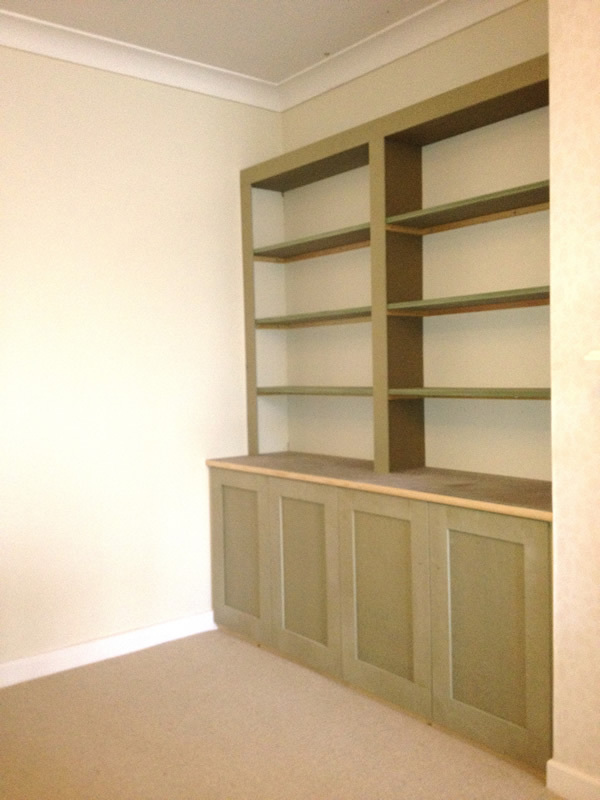 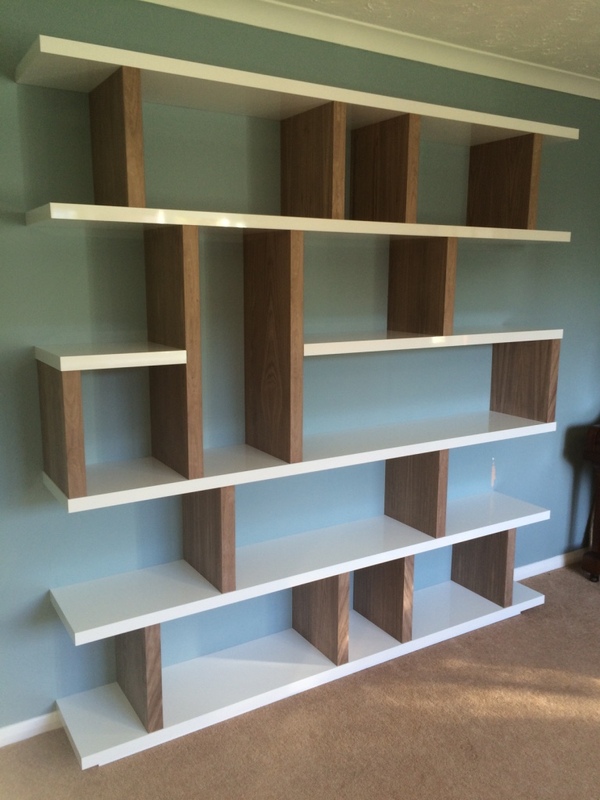 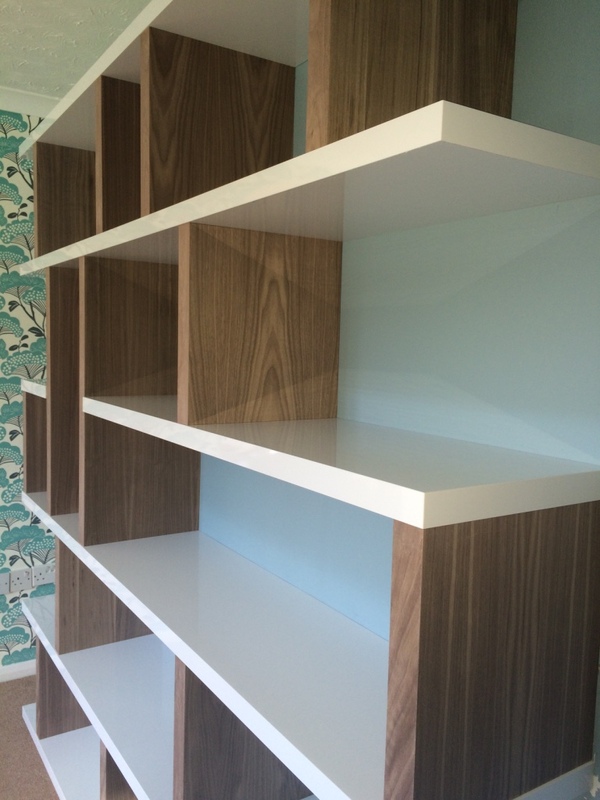 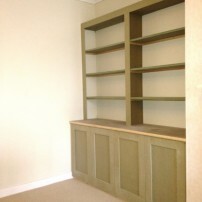 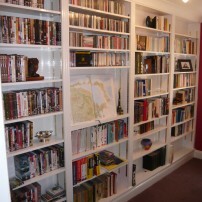 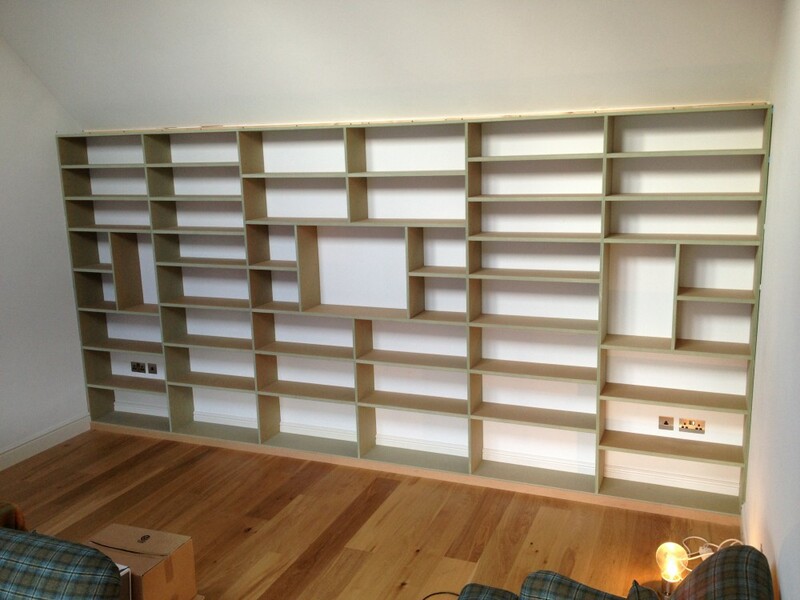 Built-in bookcases, cupboards and bookshelves. 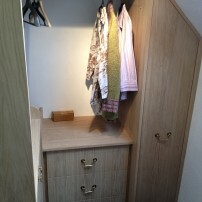 Darren gave great advice on design and materials and produced excellent units. 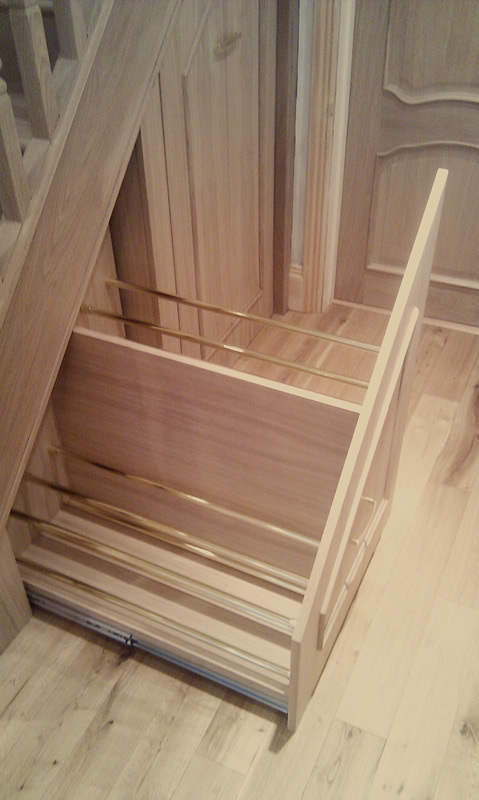 He is a real craftsman and perfectionist. 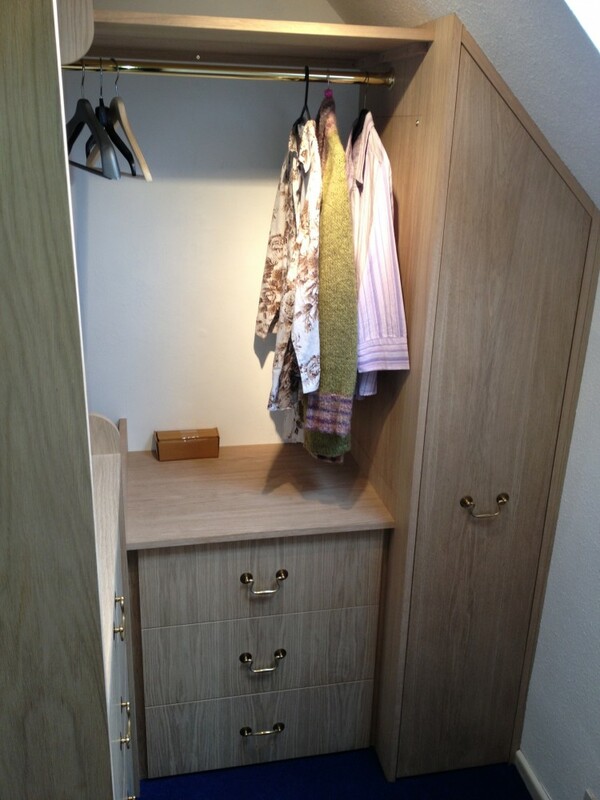 He’s reliable too–if he says he’ll arrive at 8.00am he’ll be there at that time–and his pricing very fair. 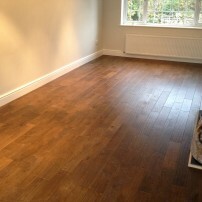 I recommend him highly and will definitely use him again. 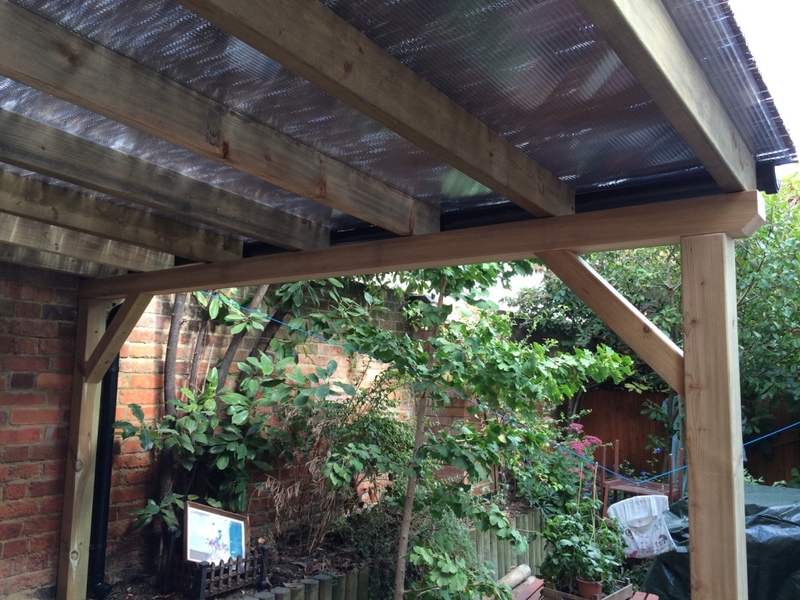 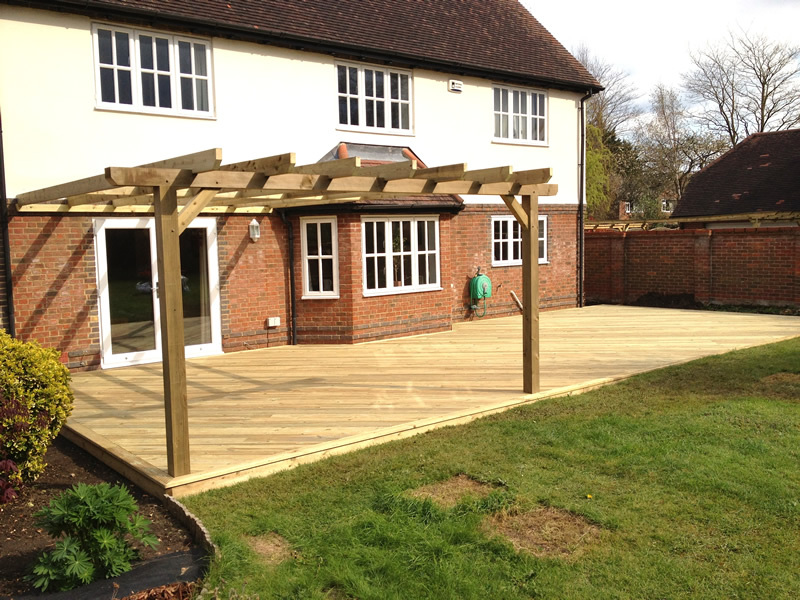 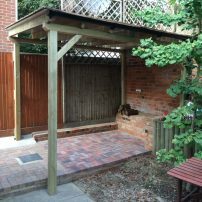 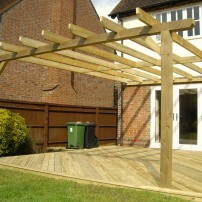 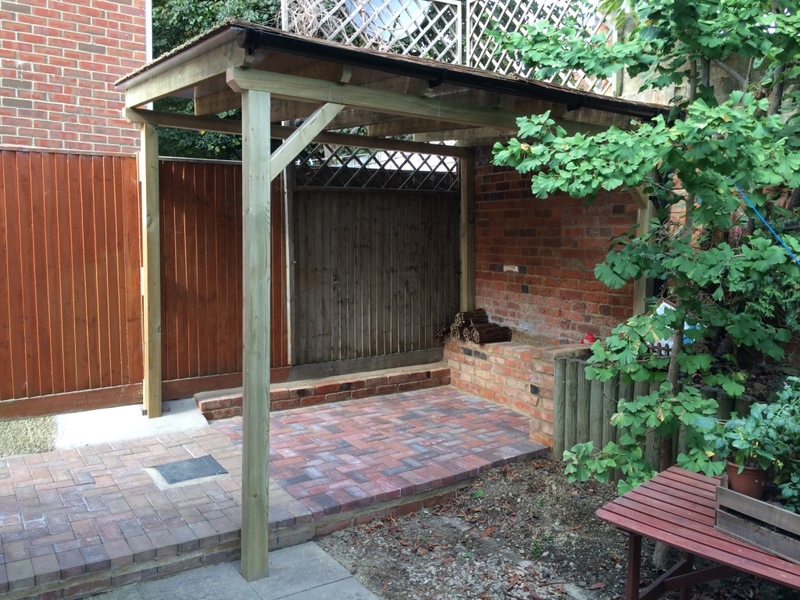 Decking and Pergola. 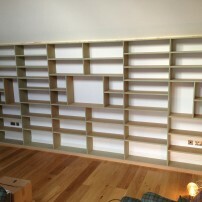 We have been planning this work for several months and Darren helped us design and plan the whole structure. 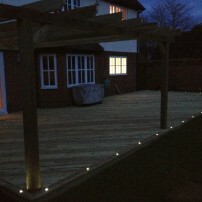 This was not a small job as the decking was 13m x 5.5m. 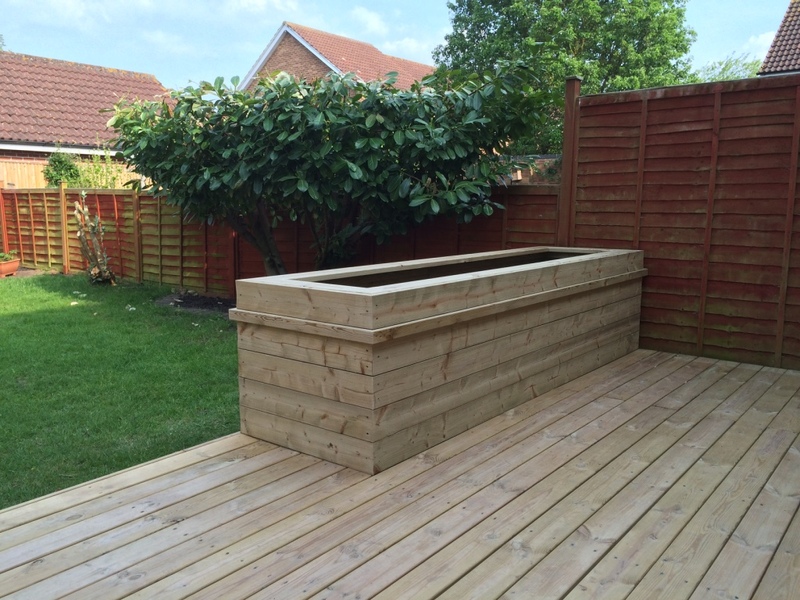 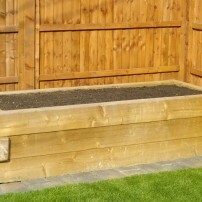 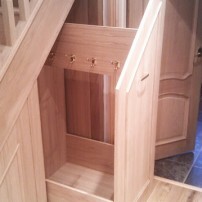 The precision and attention to detail that Darren put into the planning and the build were excellent. 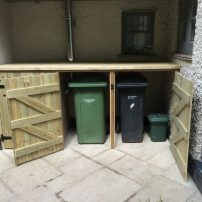 He is very reliable and committed to ensure he gets the job done (whatever the weather – and we had alot of rain!!!!). 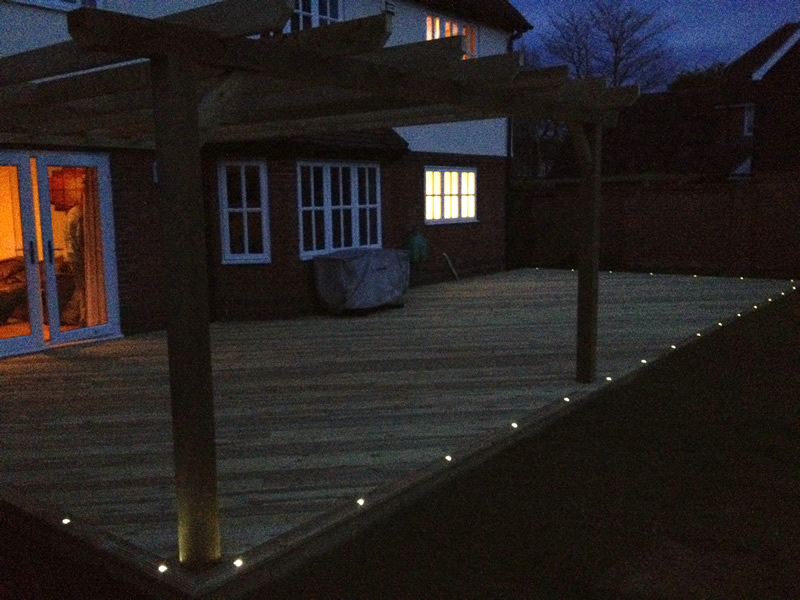 Really great job, good value for money and would never hesitate to recommend. 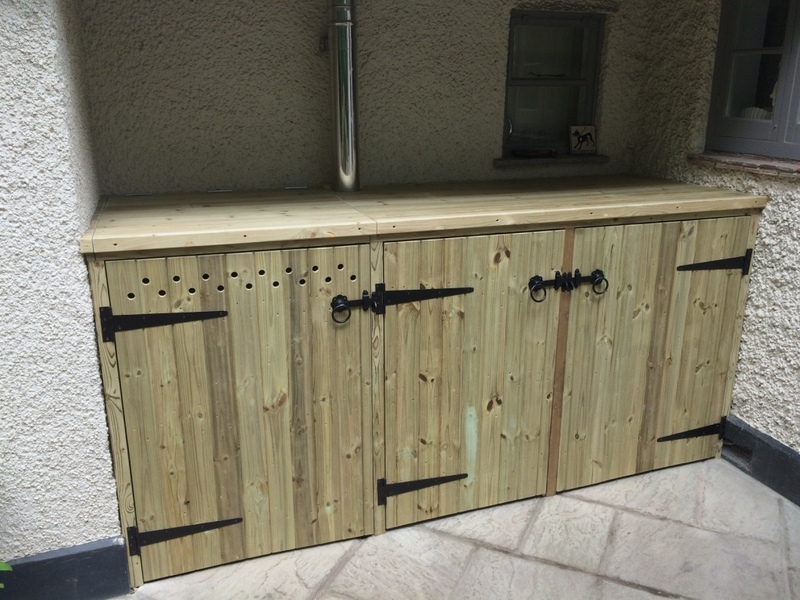 Boiler and bin store. 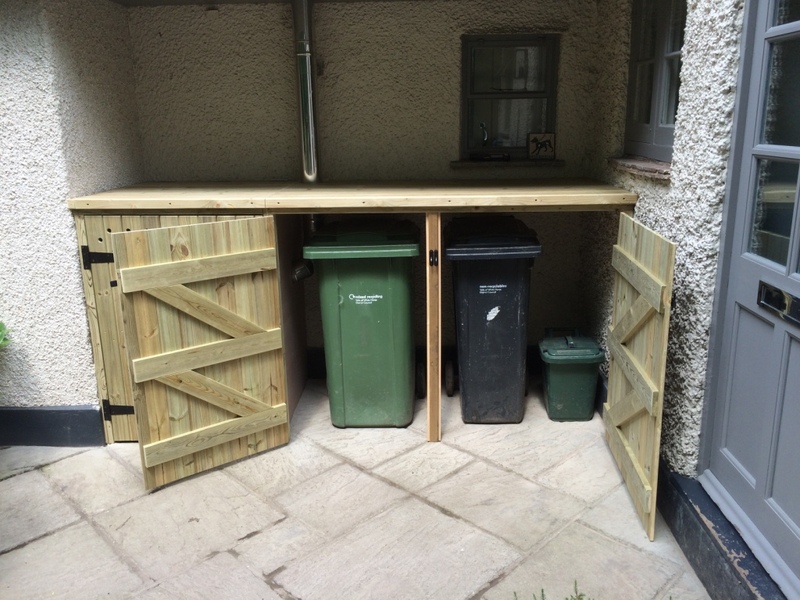 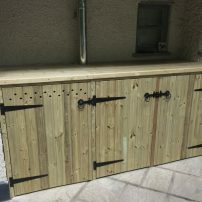 Darren designed and built a robust external storage unit to house our boiler and bins. 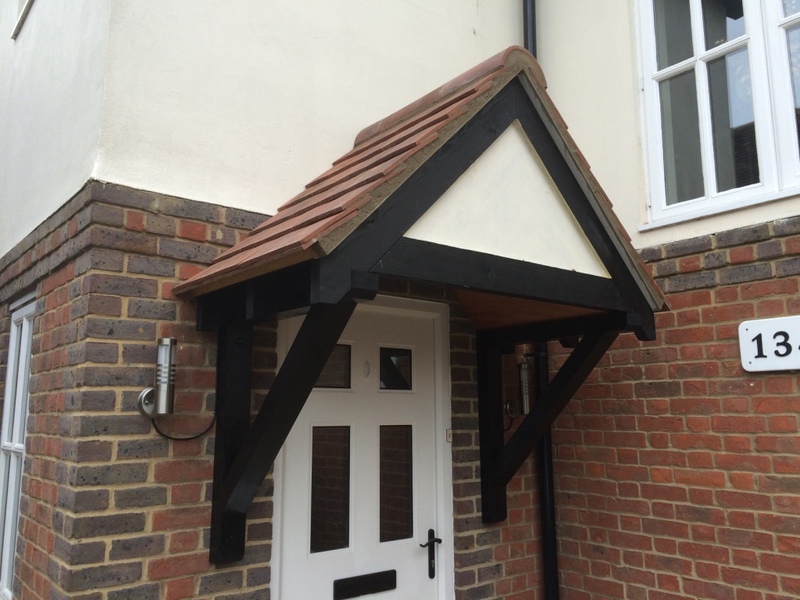 I am extremely pleased with the work; the store transformed the entrance to our house. 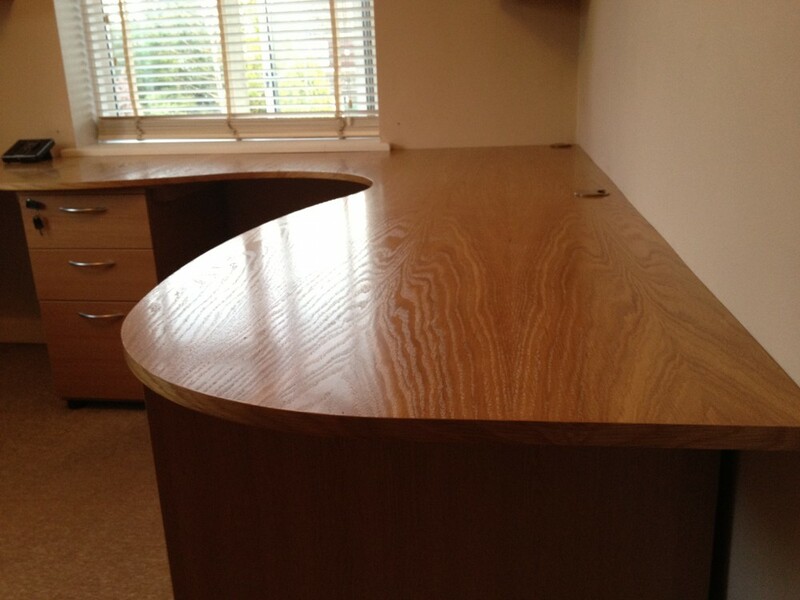 Darren was prompt, courteous and precise; he offered good value for money and had great attention to detail. 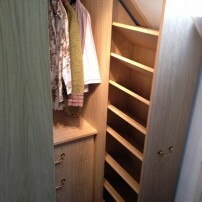 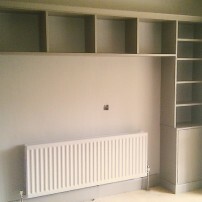 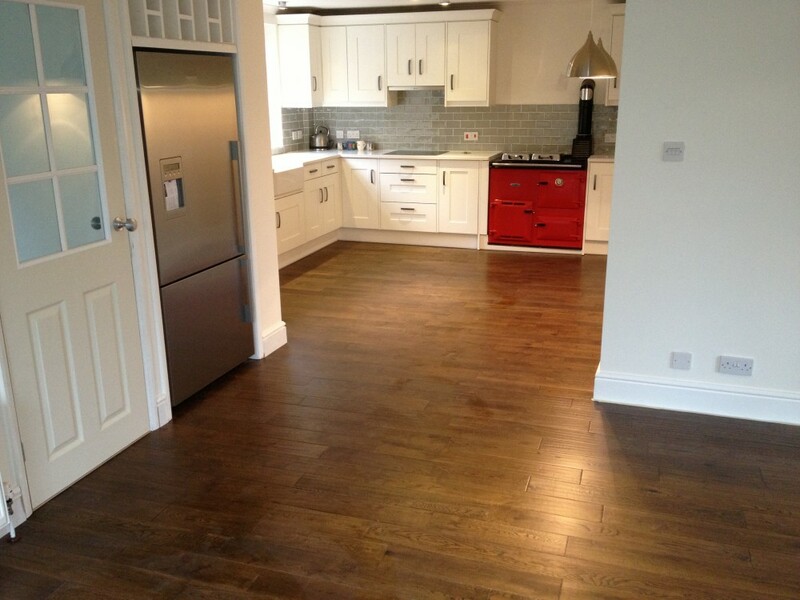 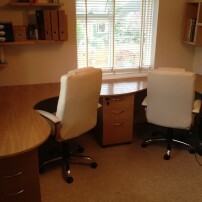 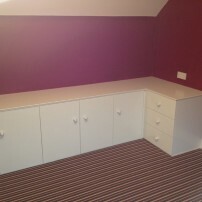 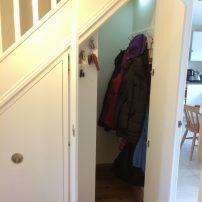 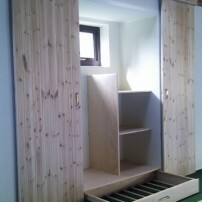 Fitted kitchen, wardrobes and more. 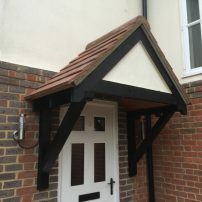 I couldn’t be more pleased with the work that Leading Edge have done for me, everything from the advice and accurate quoting at the beginning, to being reliable and tidy during the work and with a brilliant attention to detail. 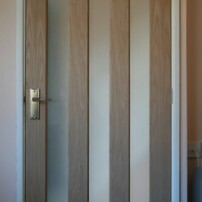 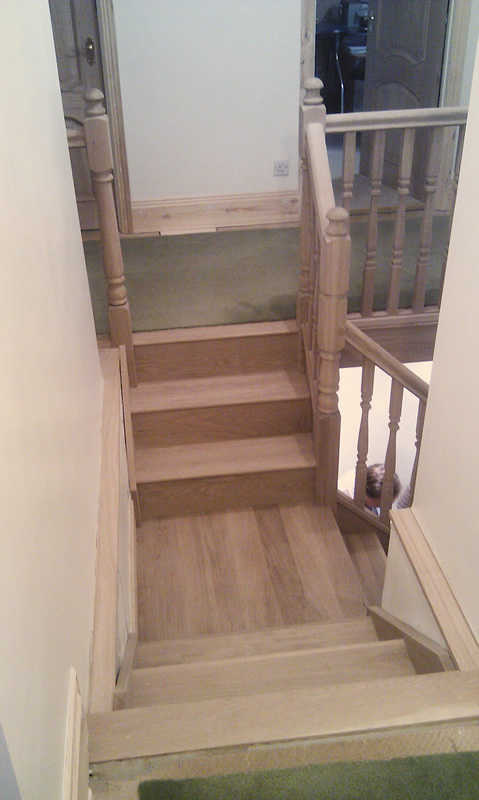 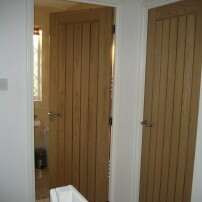 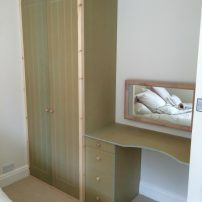 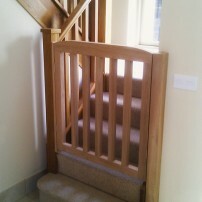 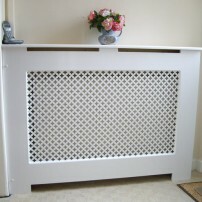 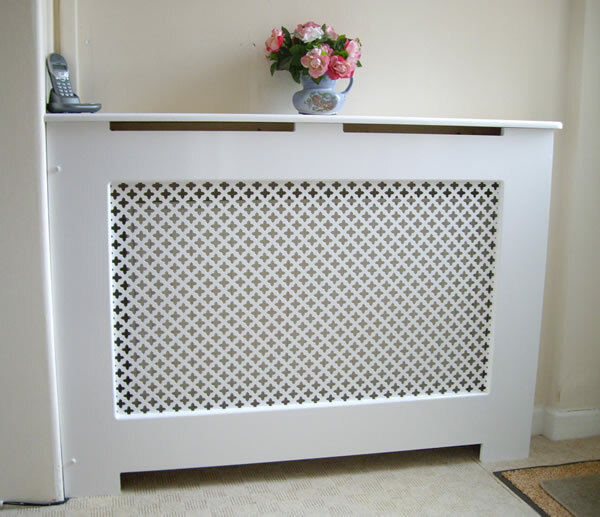 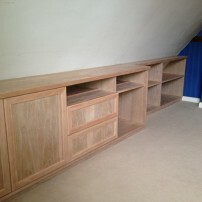 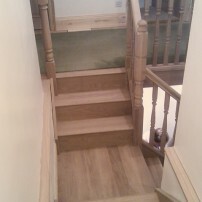 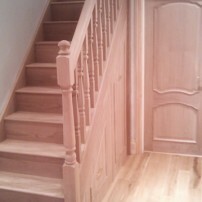 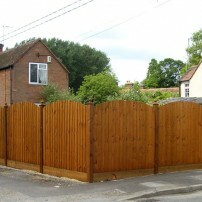 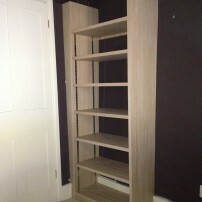 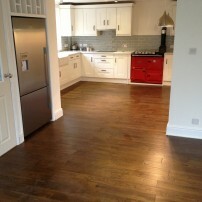 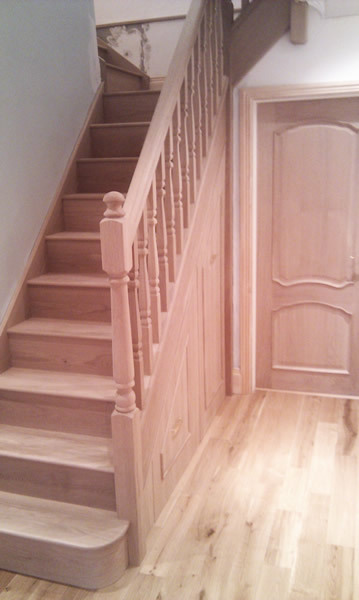 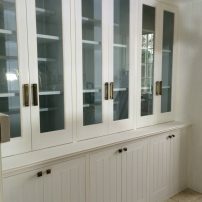 The finished job is excellent quality and exceptional value for money from such an accomplished craftsman. 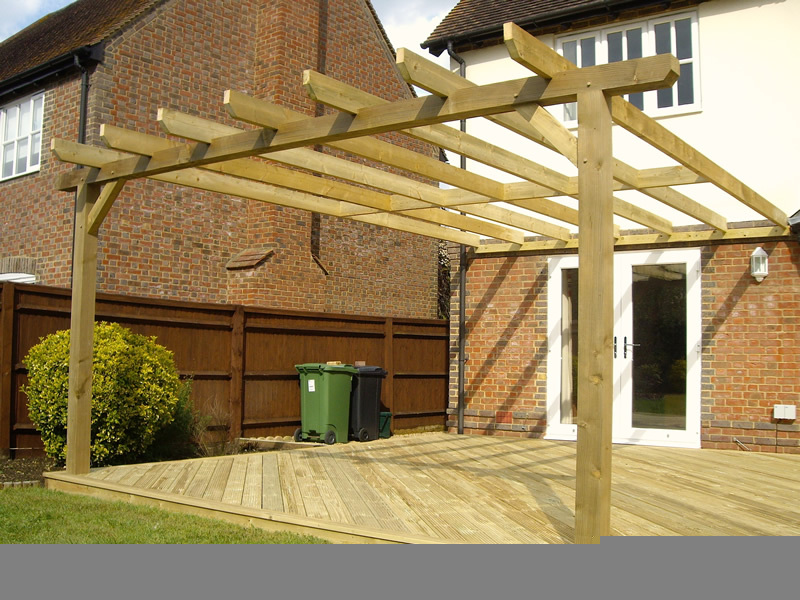 I have used them repeatedly and wouldn’t hesitate in recommending them. 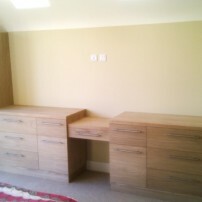 Delighted, I have been highly impressed with Darren and the work he has carried out for me. 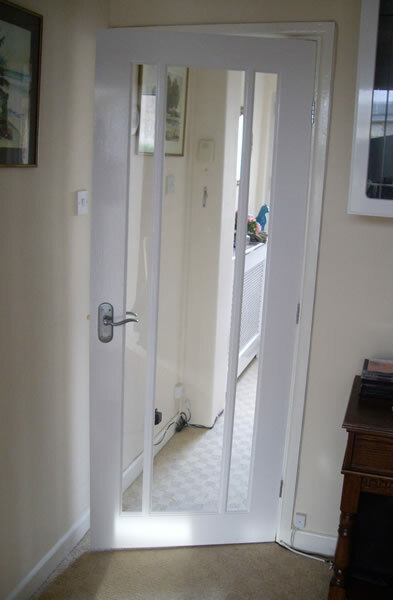 He had a really tough job – crooked walls, wonky floors and a demon puppy to contend with. 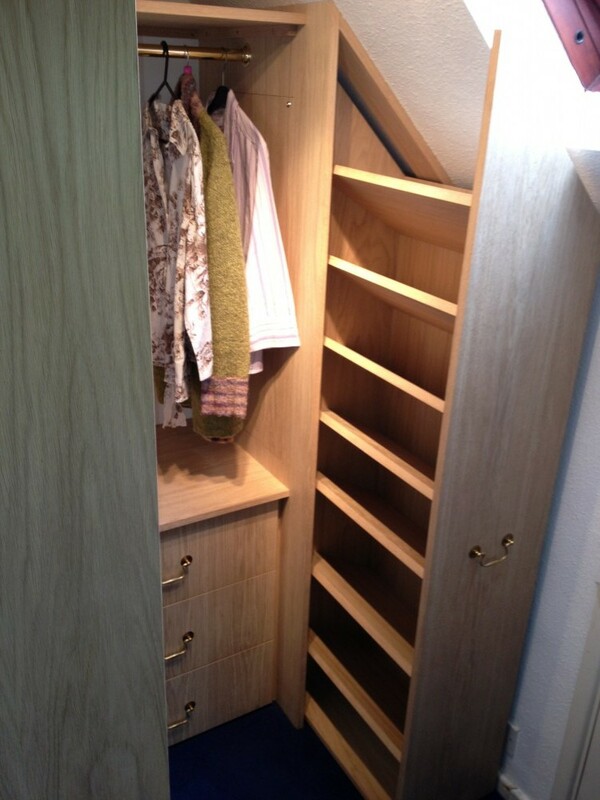 He rose above it all to produce the most fantastic wardrobe arrangement which I am really delighted with. 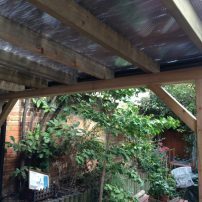 Apart from the standard of his craftsmanship, he was a “dream” workman – he erected a tent in the garden where he did all his cutting, he covered my bed, he tidied away his tools each and every night in the week he was working at my house and, essentially, despite the size of the job, I wouldn’t have known he was there. 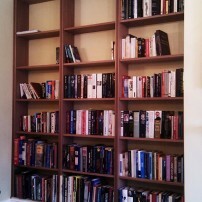 He comes highly highly recommended. 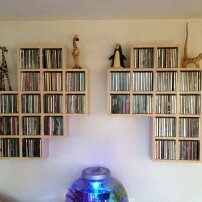 Thanks Darren!